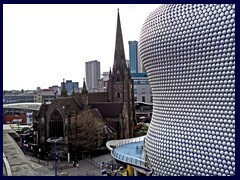 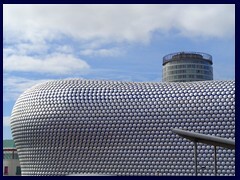 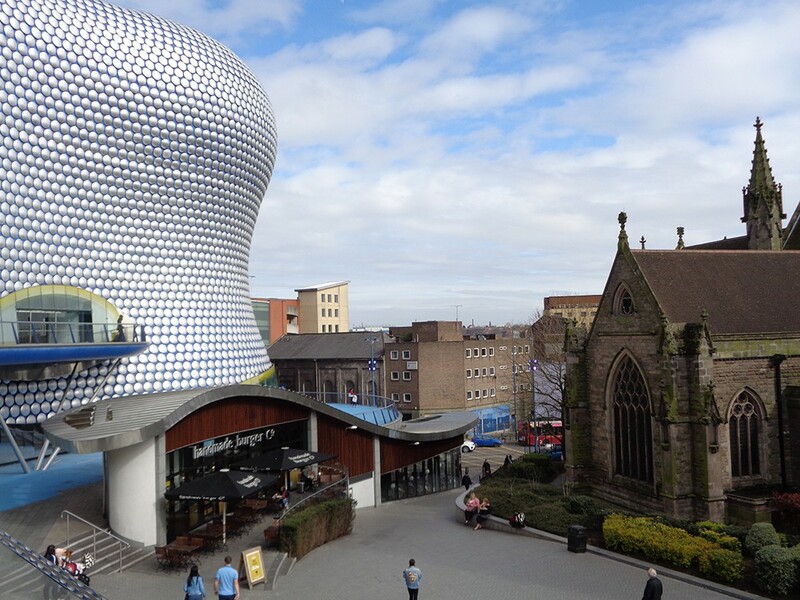 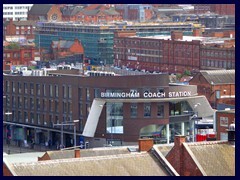 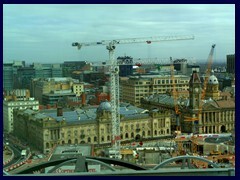 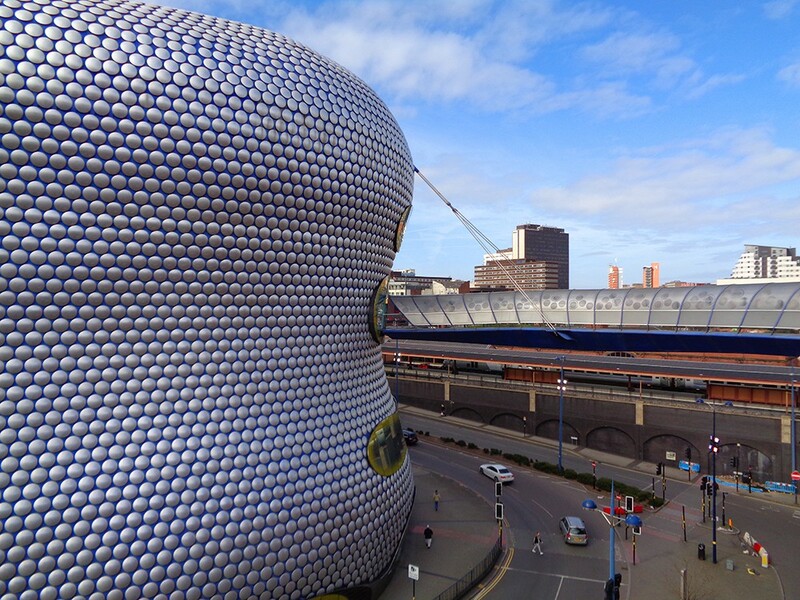 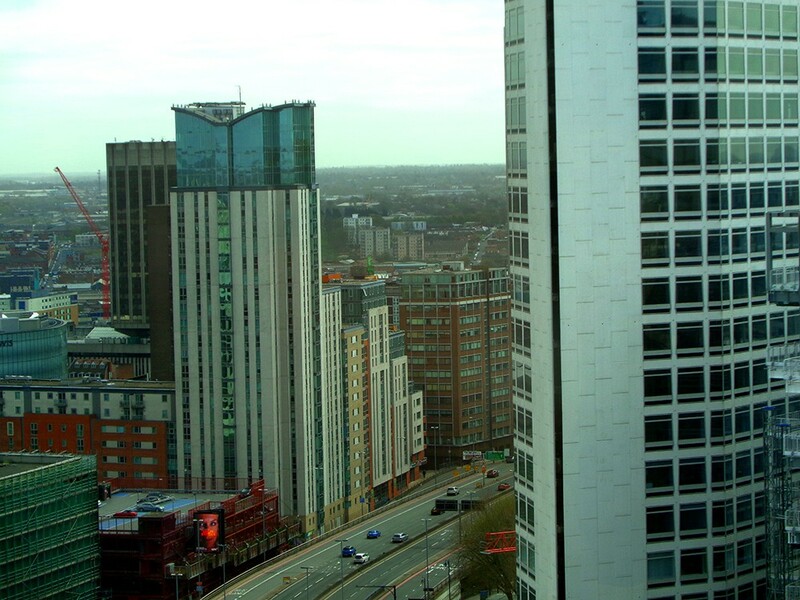 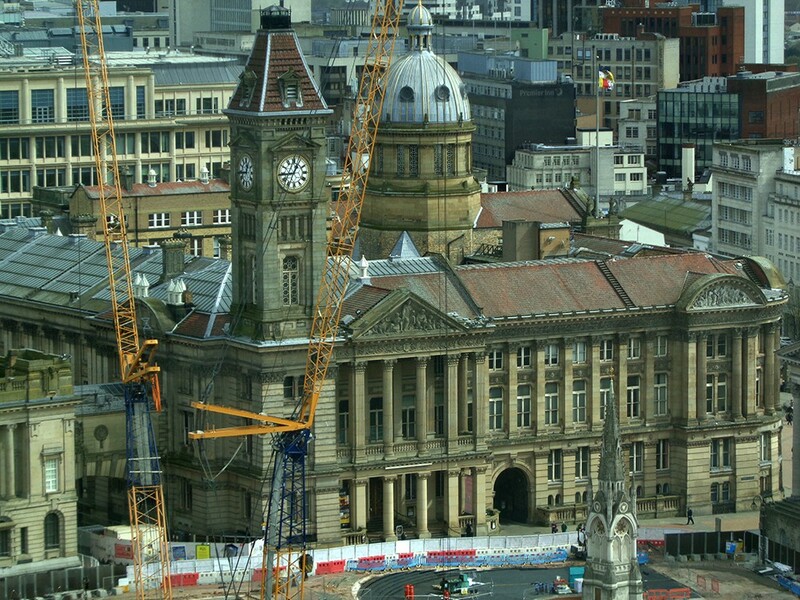 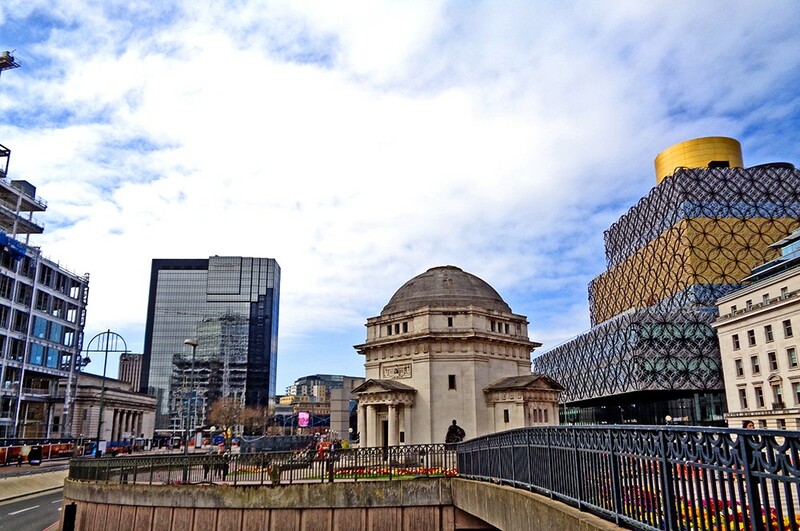 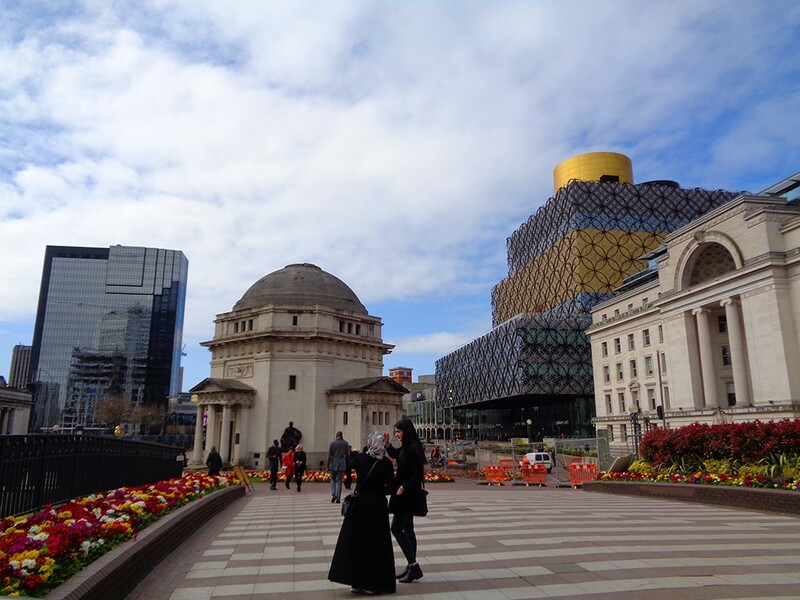 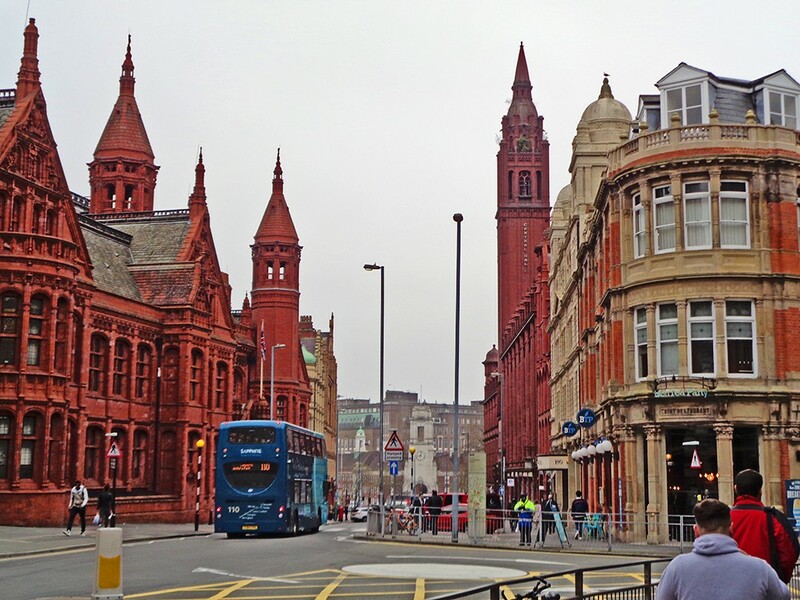 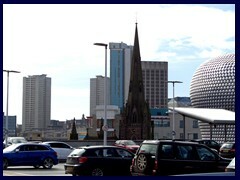 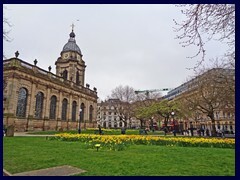 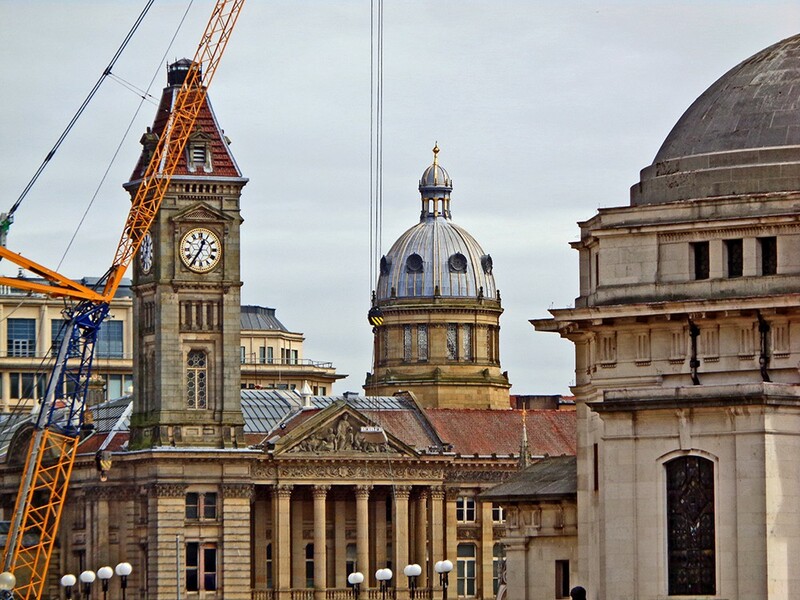 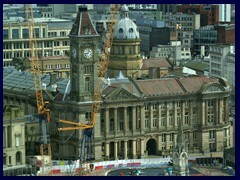 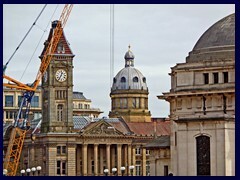 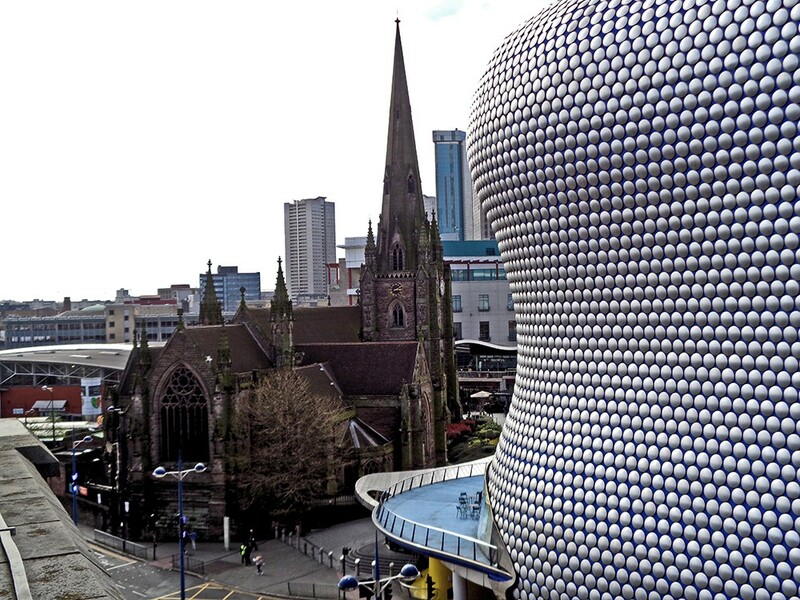 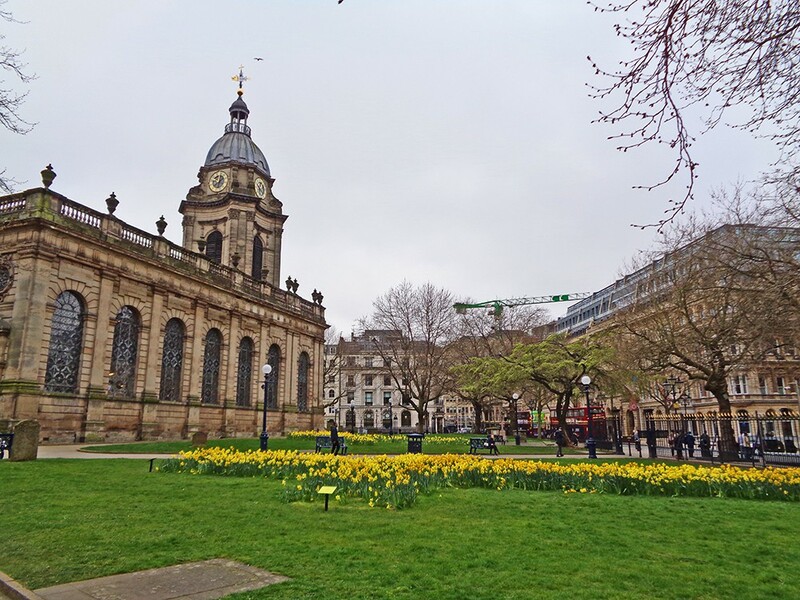 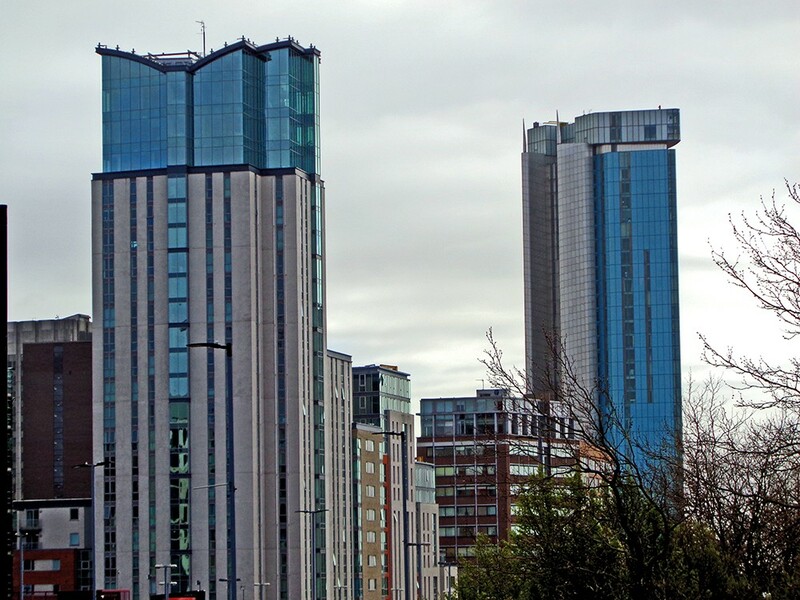 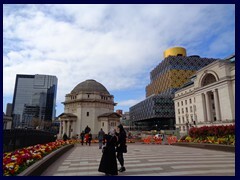 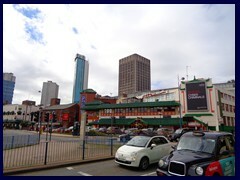 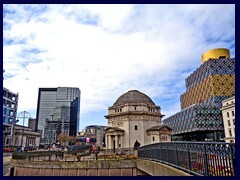 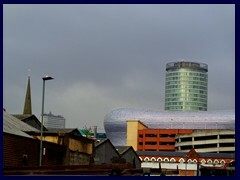 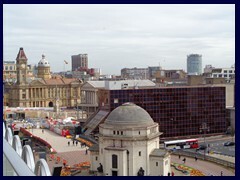 Birmingham has many skyscrapers, highrises, churches and towers for a European city, and the skyline is 2nd only to London in the UK. 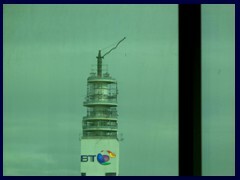 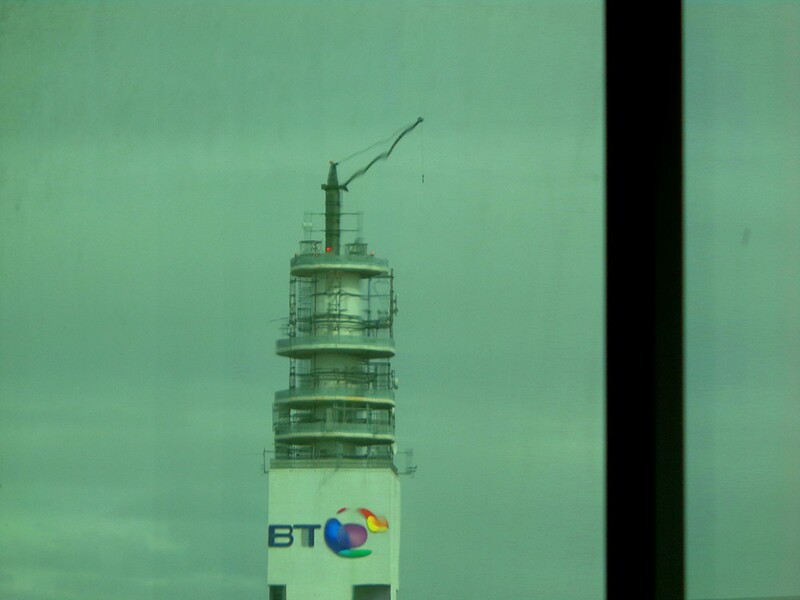 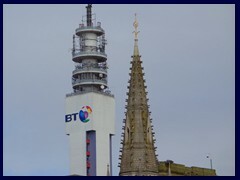 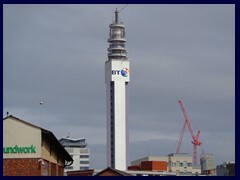 The tallest structure is the 152m high (to the spire) BT Tower (British Telecom Tower) since the completion in 1969. 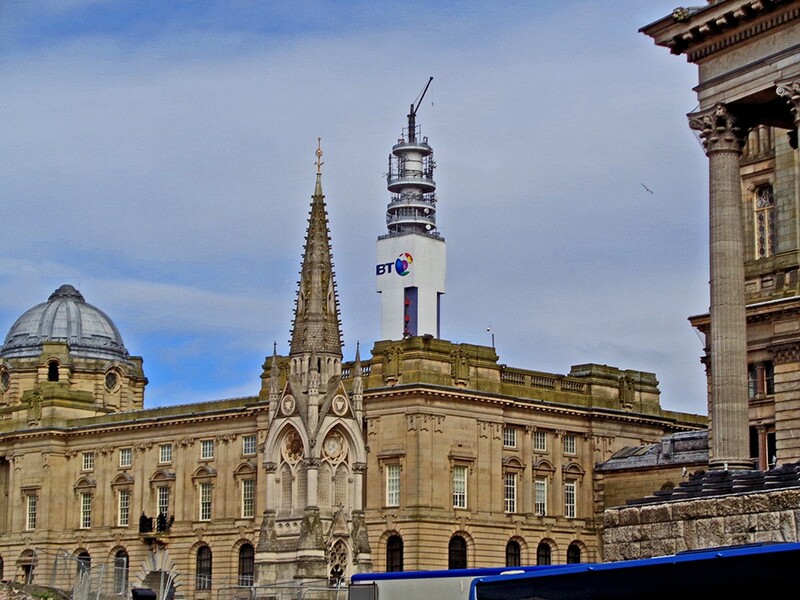 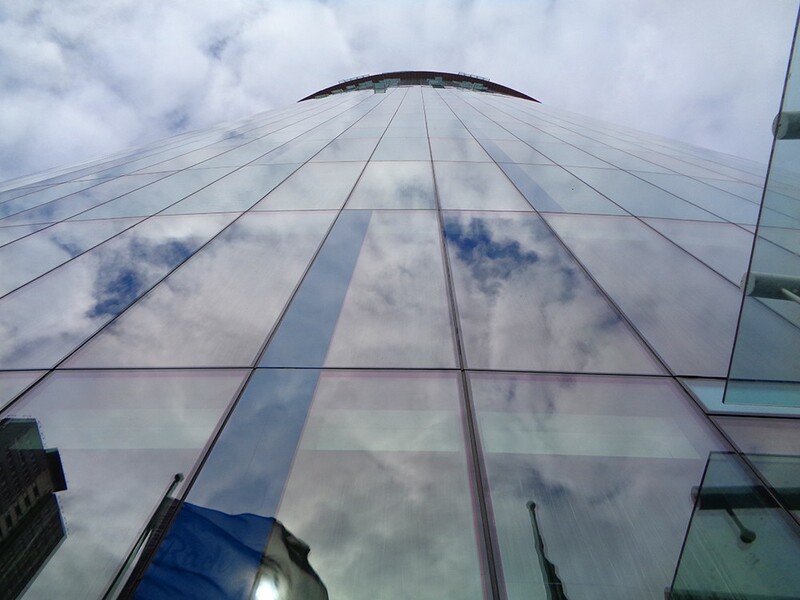 It was formerly known as the Post Office Tower and GPO Tower, and is a telecommunications tower that is situated in the West part of the city centre, and features a boxy design with a circular top. 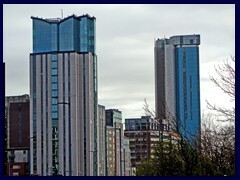 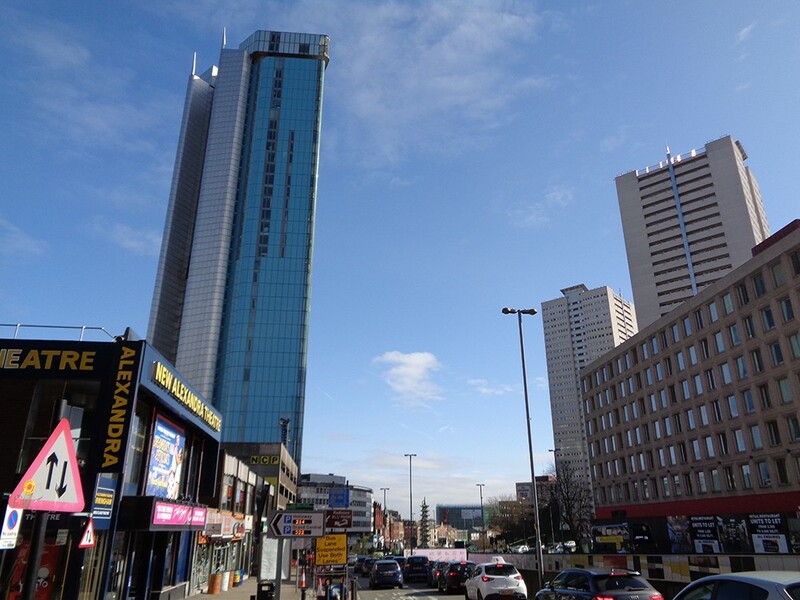 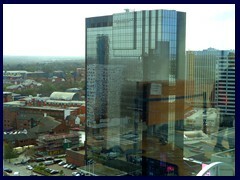 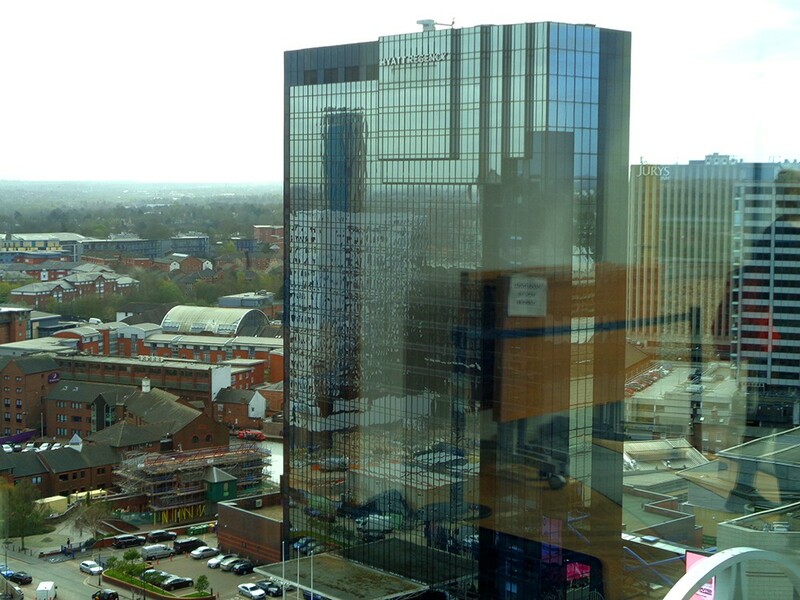 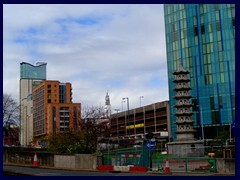 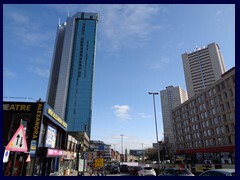 The tallest skyscraper, and 2nd tallest structure in Birmingham (2017), is 10 Holloway Circus, also called the Beetham Tower. 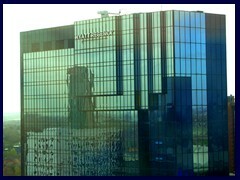 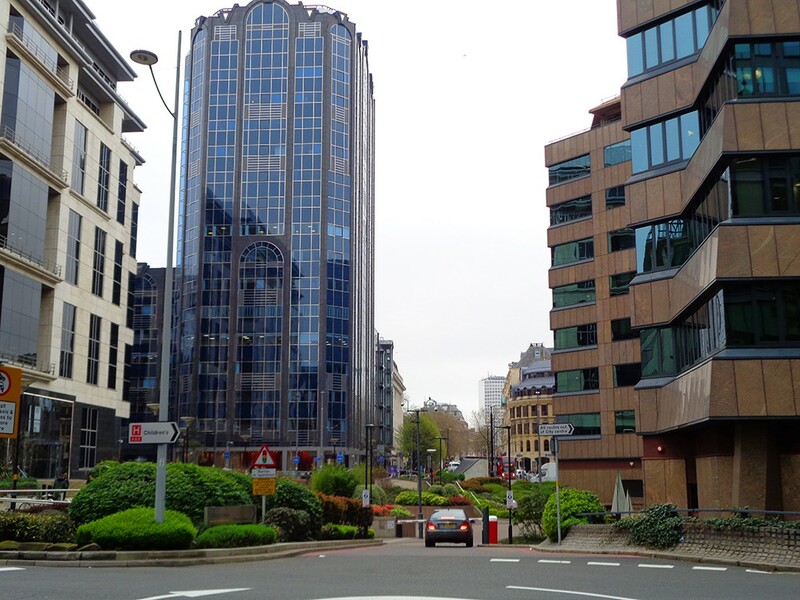 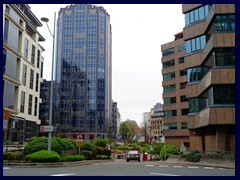 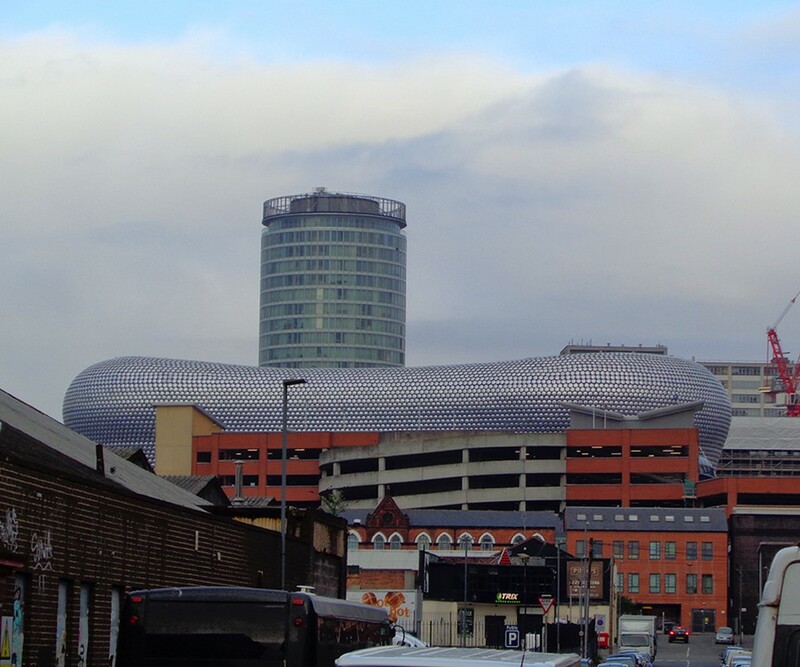 It was completed in 2005 and is a 130m tall, mixed-use building, partly circular in its design with a glass facade of mixed green and blue glass facing Holloway Circus, and a more conventional backside. 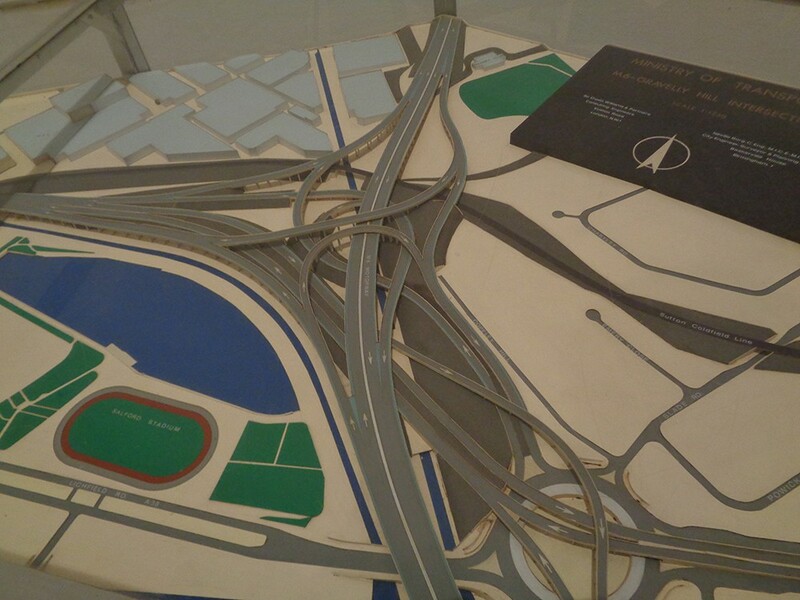 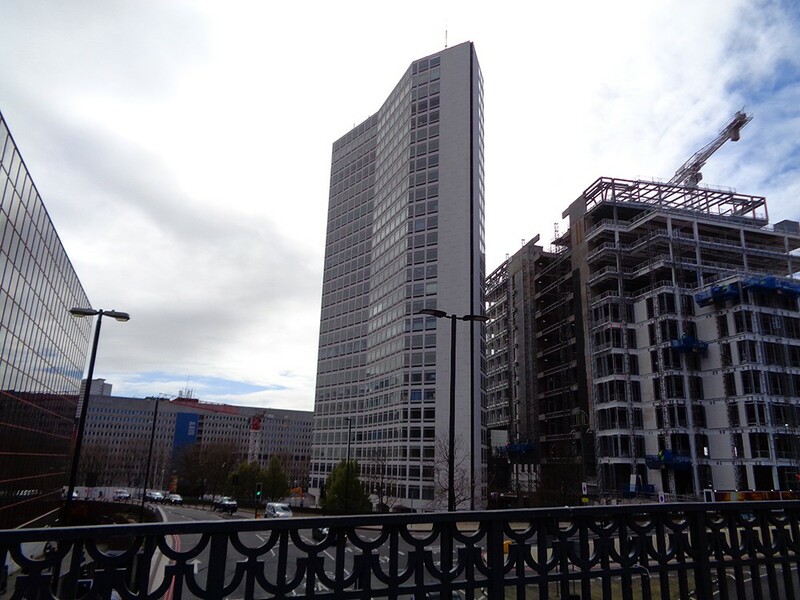 It was designed by Ian Simpson (architect behind all Beetham towers) in postmodern style and features a Radisson Blu Hotel and apartments. 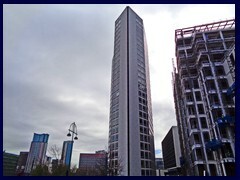 In 2018 the Beorma Quarters glass office tower will be the 2nd tallest skyscraper. 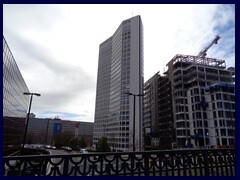 Alpha Tower, built in 1970, is currently (2017) the 2nd tallest skycraper, with its white diagonally irregular design. 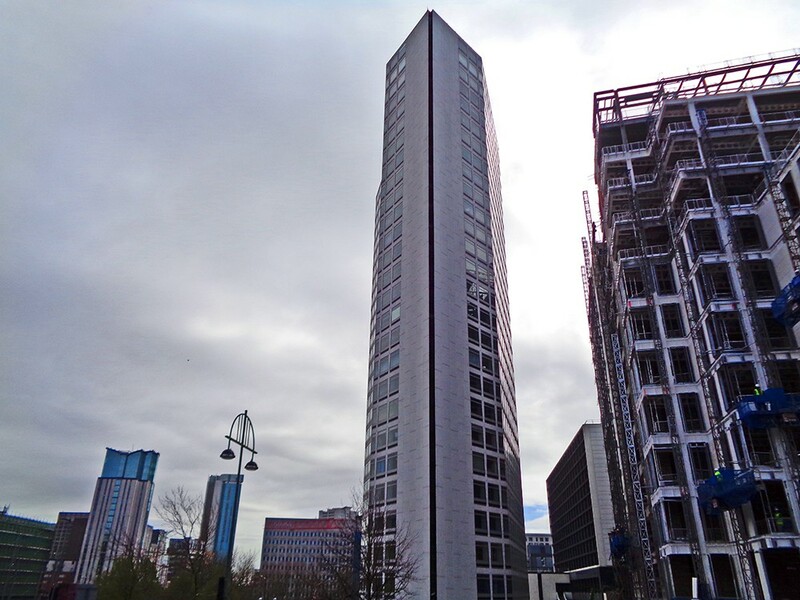 It has 28 floors and is 100m to the roof. 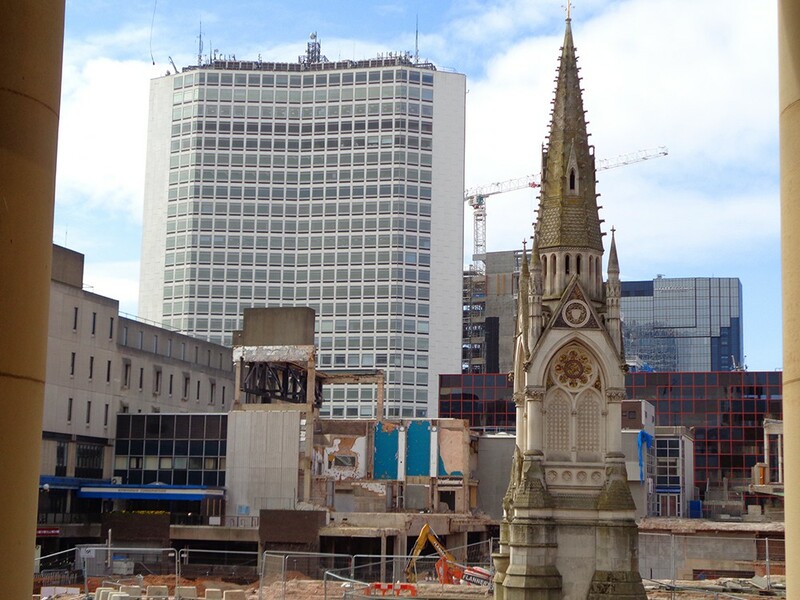 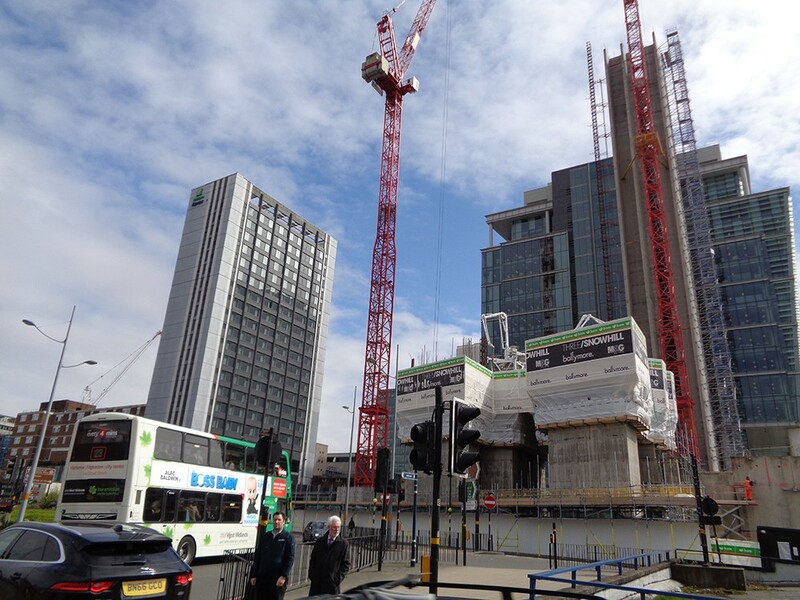 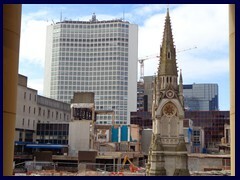 In 2019, the 163m high pinnacle of 103 Colmore Roof's spire will beat all other structures, right next to the St Philip's Cathedral. 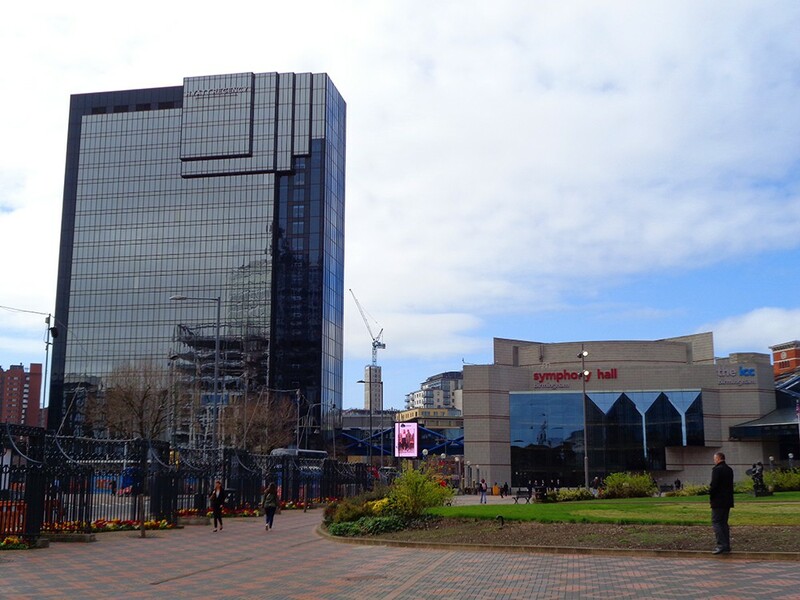 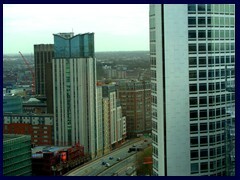 At Centenary Square, you find several skyscrapers and highrises, among them the 75m tall, 24-storey Hyatt Regency, a great glass landmark hotel, built in 1990. 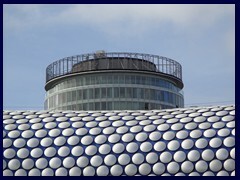 Nearby is the Orion Tower with its postmodern roof. 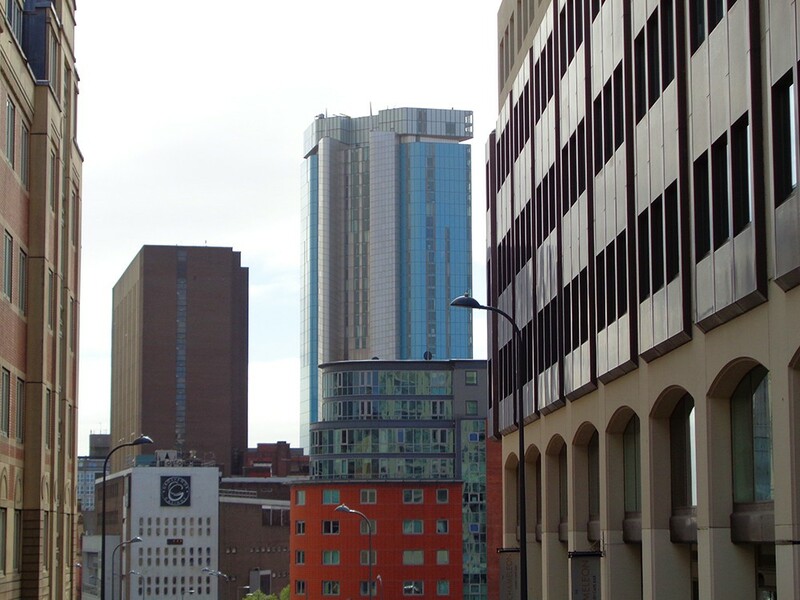 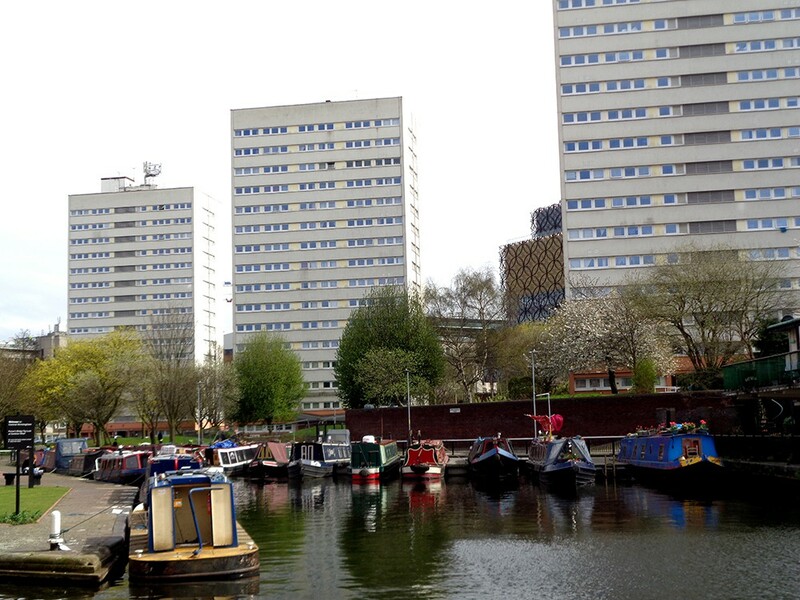 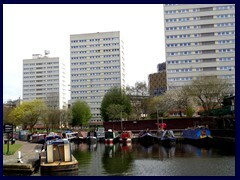 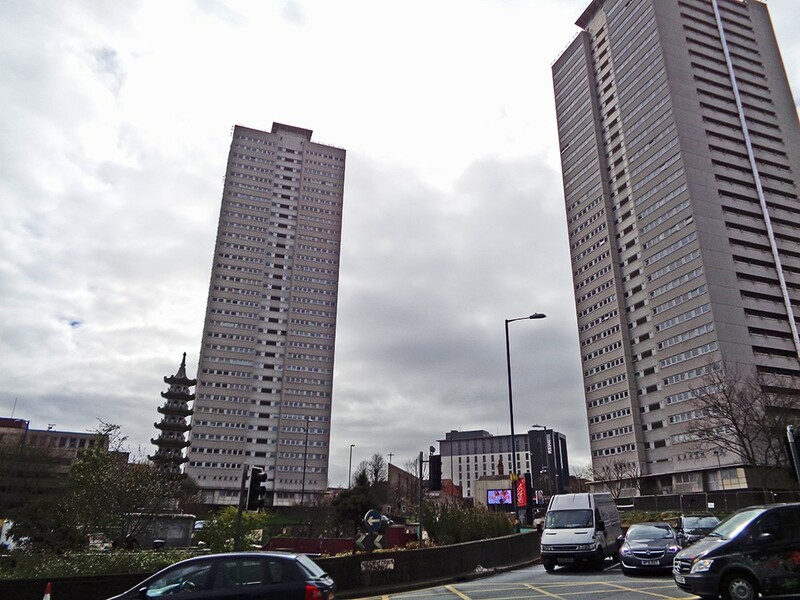 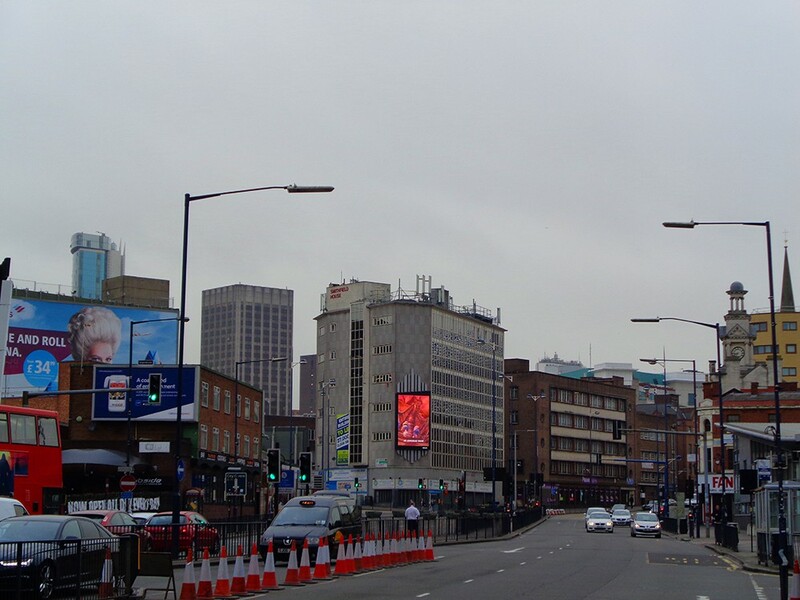 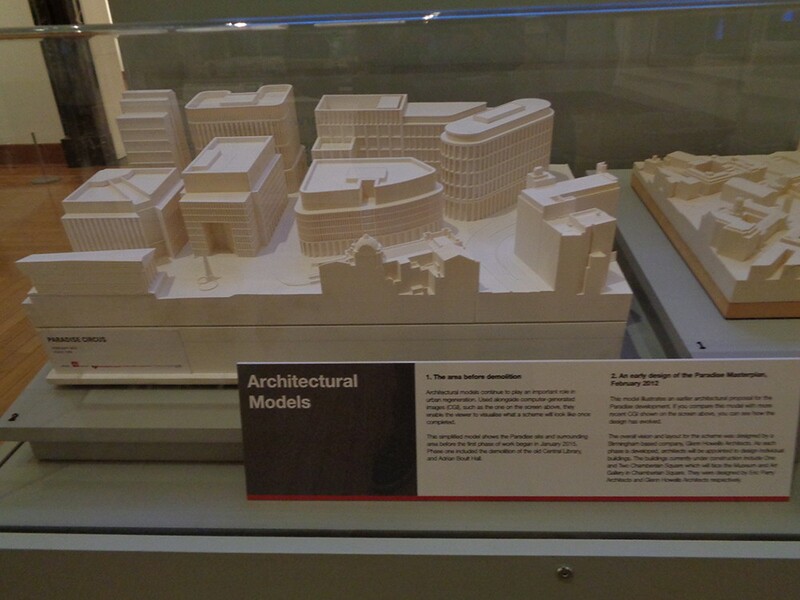 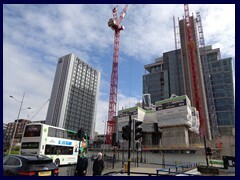 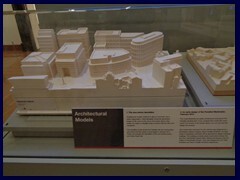 There are also a lot of grey modernist highrise buildings, around 30 floors tall, around central Birmingham. 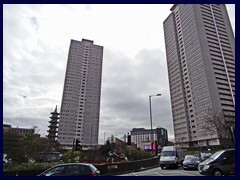 They look dull and were built in the 1960s or 70s, and some of them have been torn down due to impopularity and bad conditions. 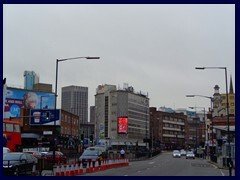 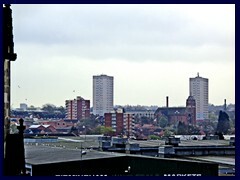 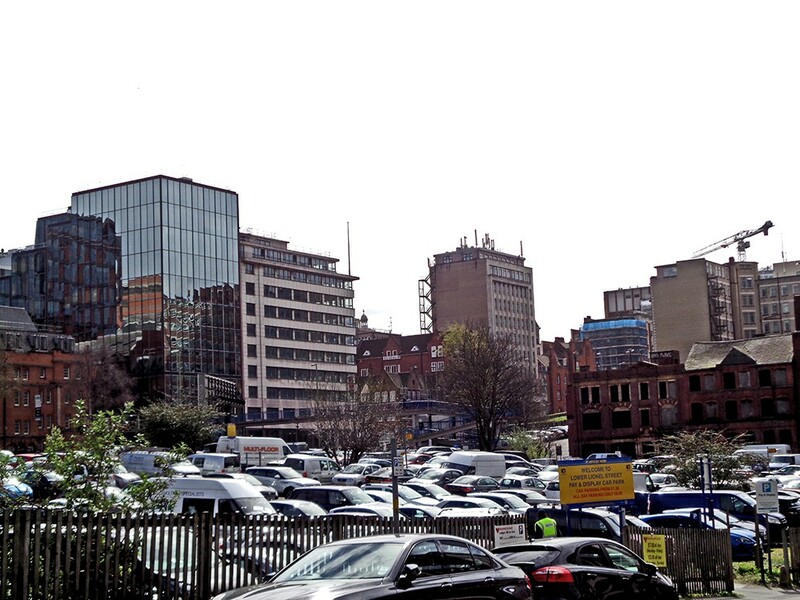 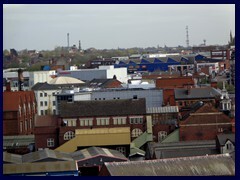 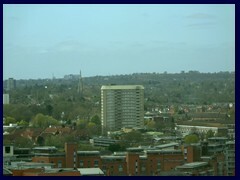 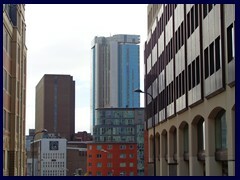 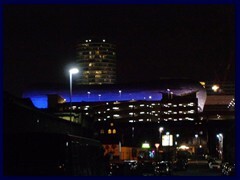 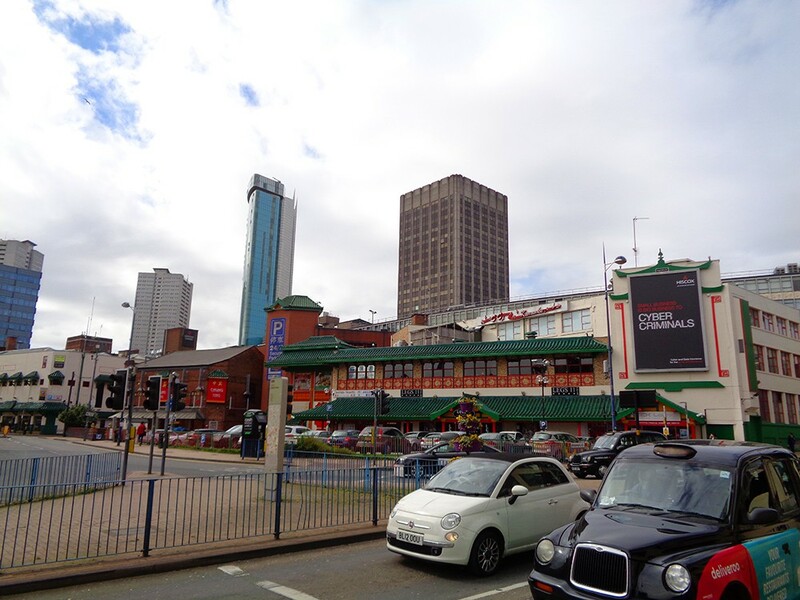 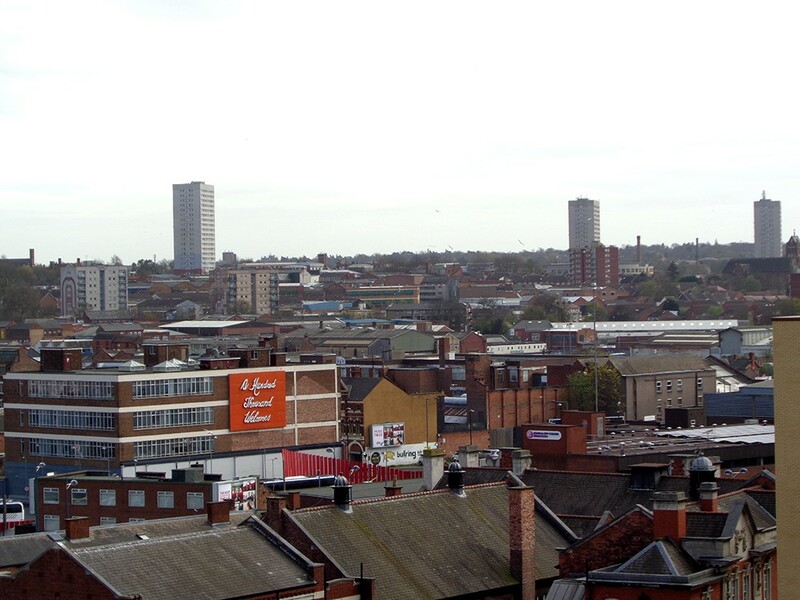 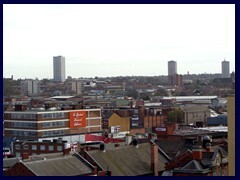 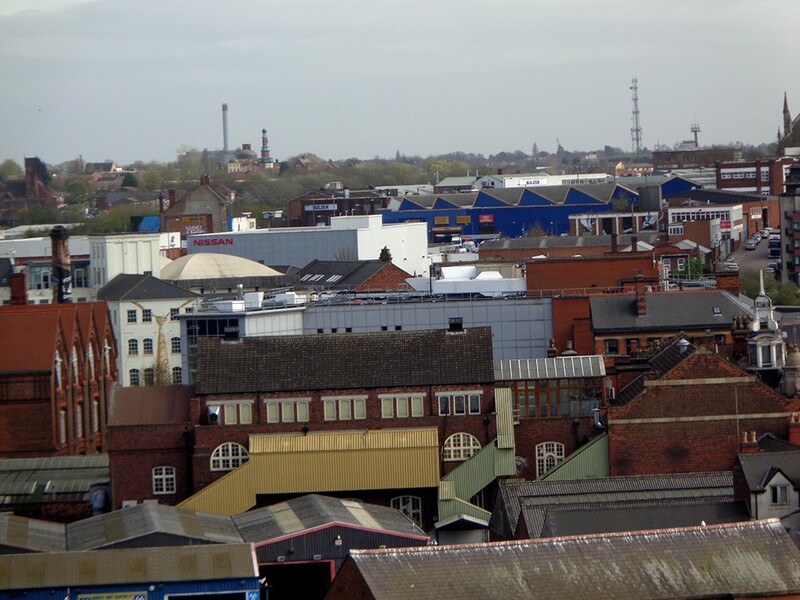 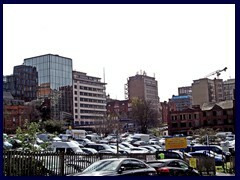 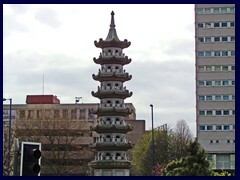 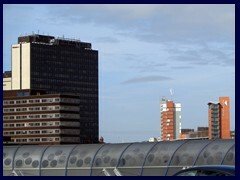 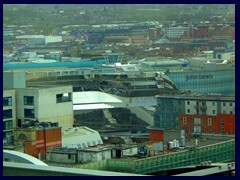 Thus Birmingham had a significant skyline ever since the late 1960s, but not until the 2000s many of the better looking international style skyscrapers where built. 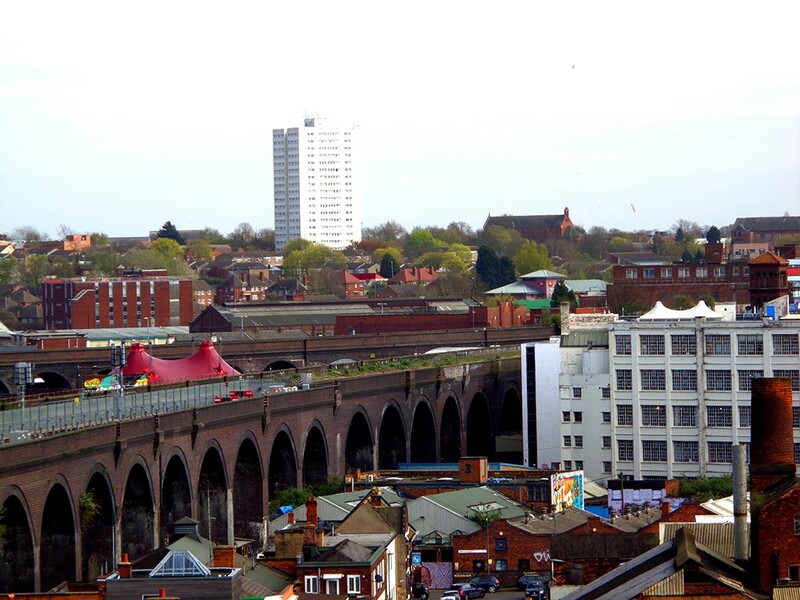 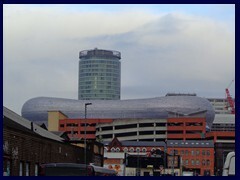 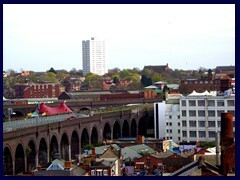 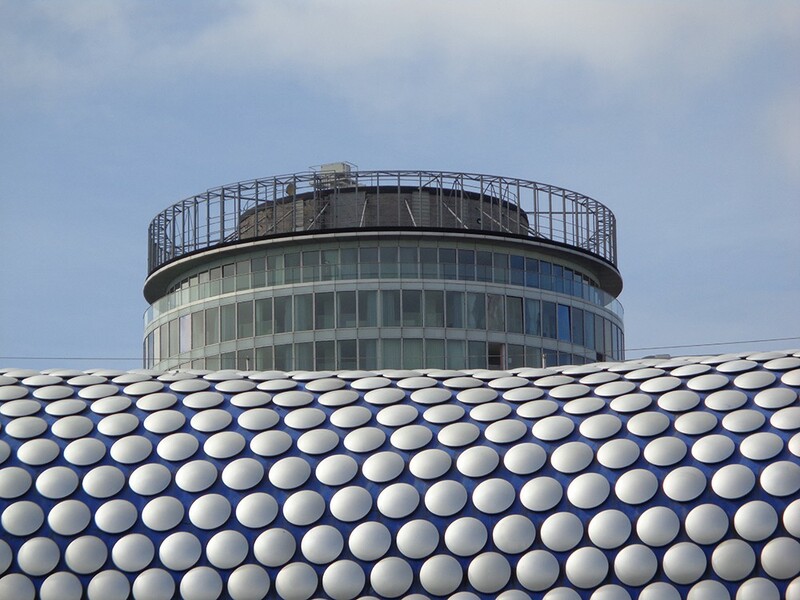 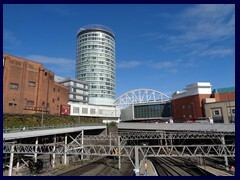 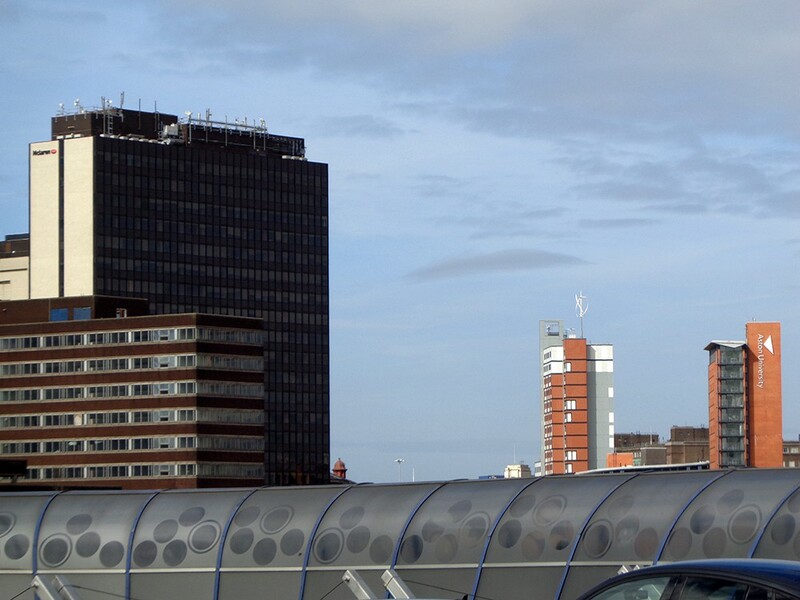 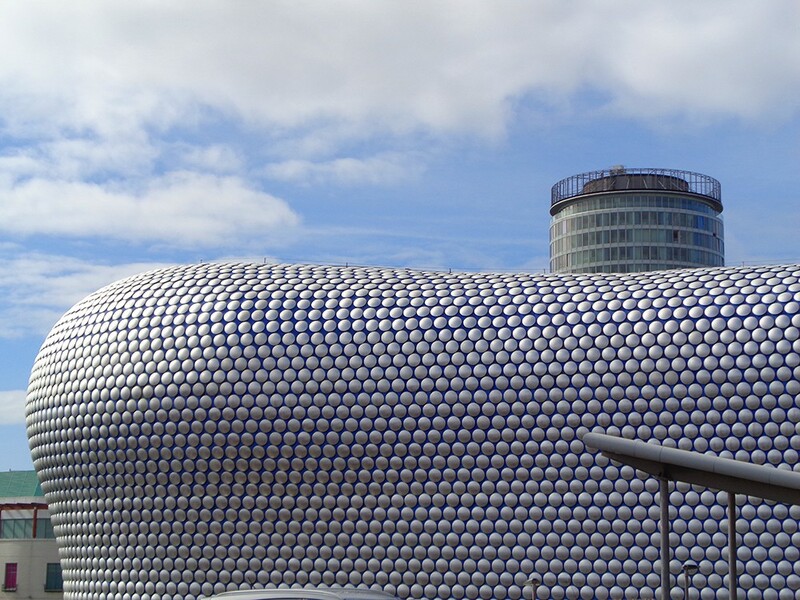 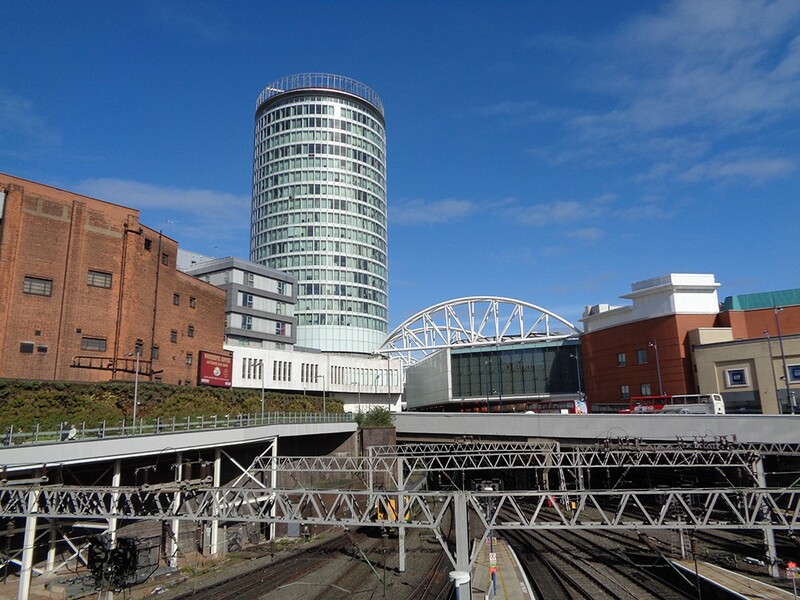 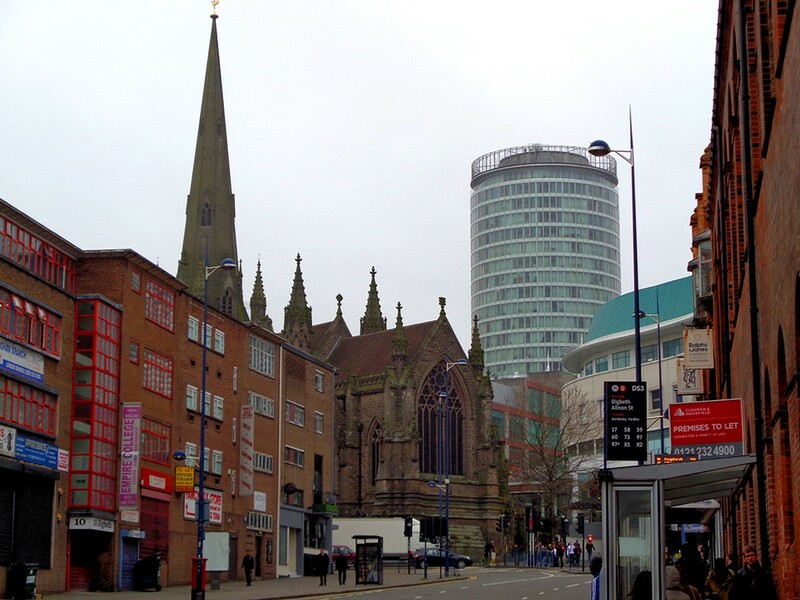 The landmark of the Bull Ring is the 23-storey Rotunda, a circular office highrise from 1965 that was the city's tallest skyscraper for 5 years. 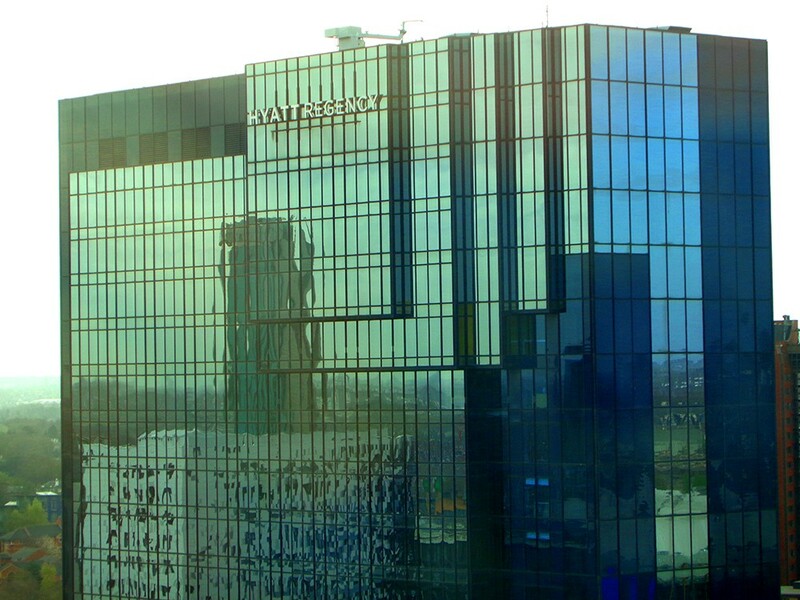 In the early 2000s it was recladded with a more attractive green glass design. 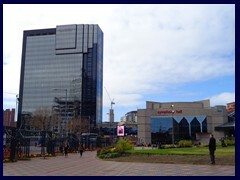 Colmore Gate is a postmodern highrise from 1992, situated in the Snow Hill business district, where several other skyscrapers are under construction. 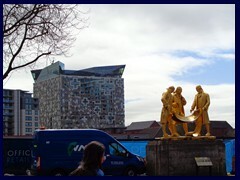 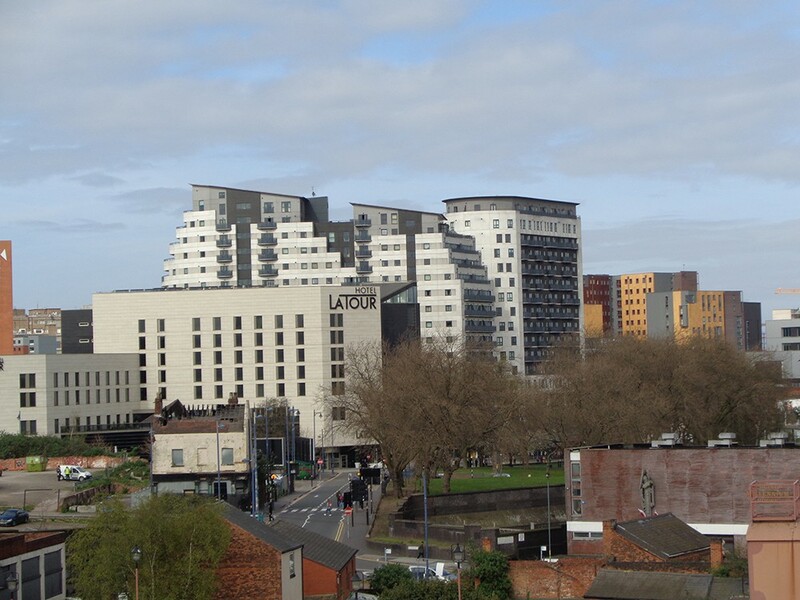 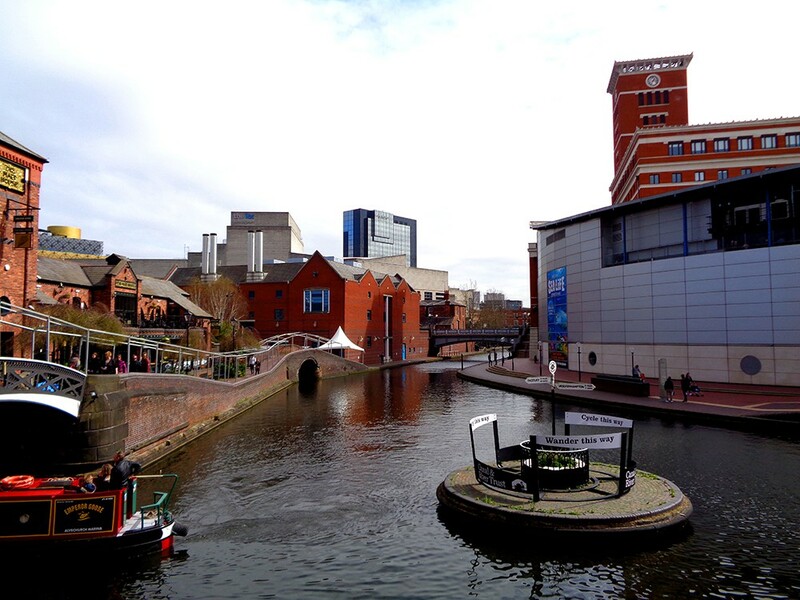 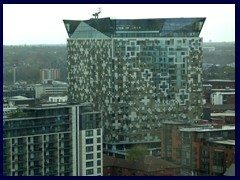 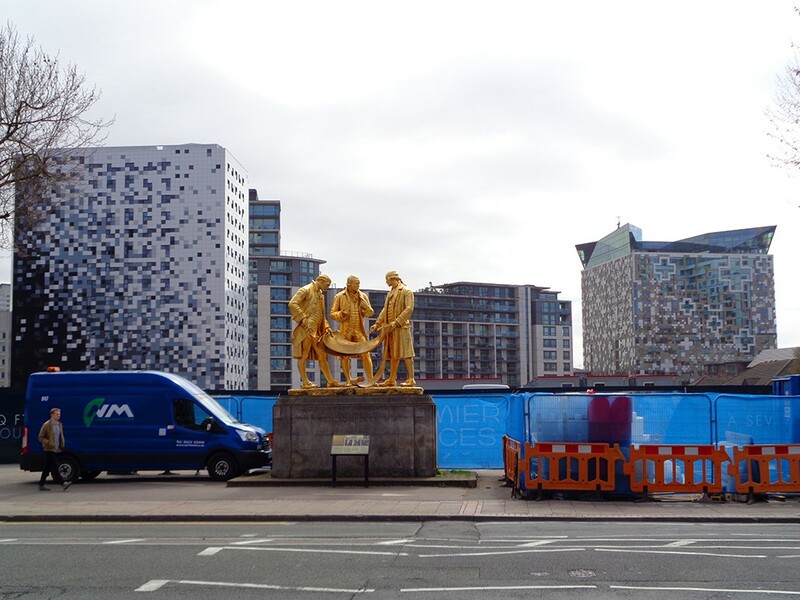 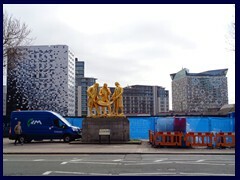 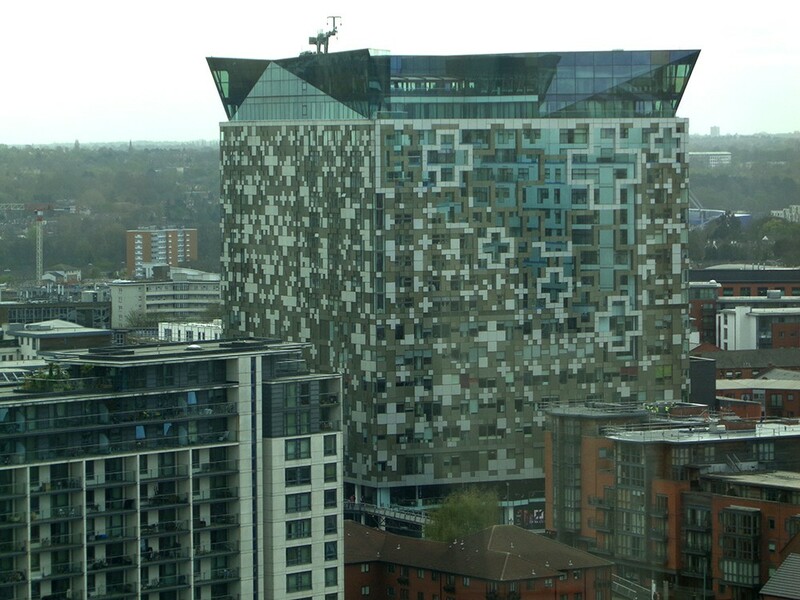 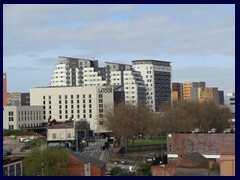 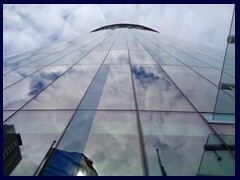 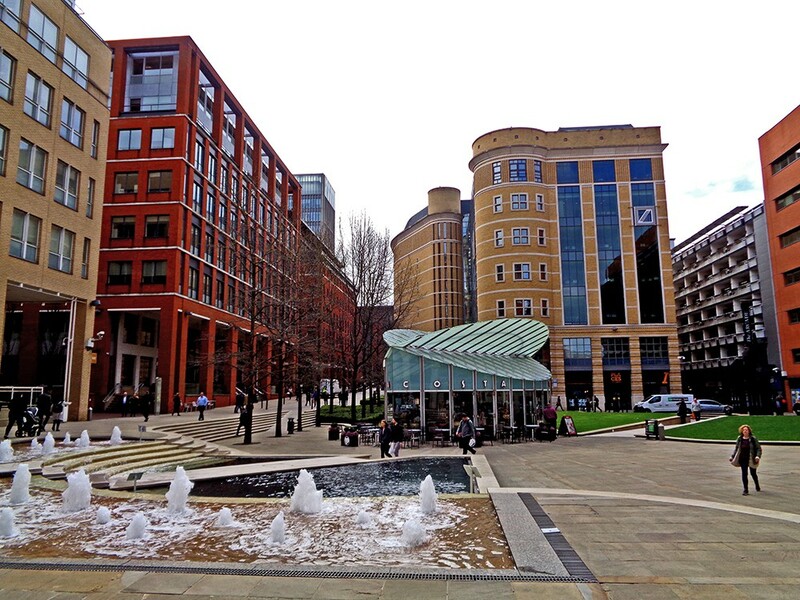 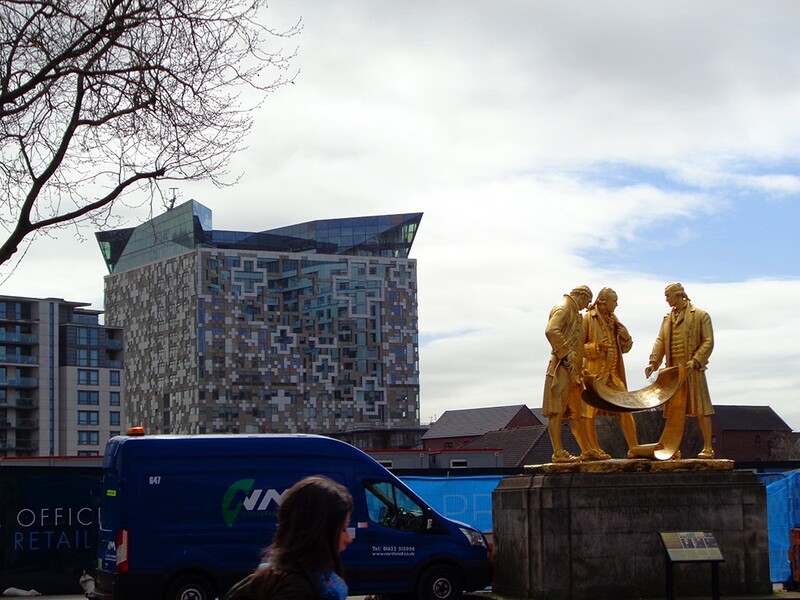 The Cube is a futuristic looking mixed use highrise, situated between the Mailbox and the canal. 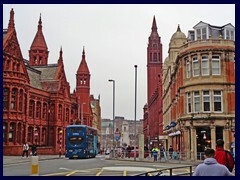 There are many churches in the city, not particulary tall though. 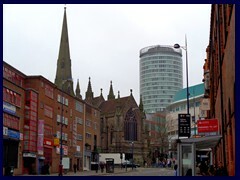 St Martin in the Bull Ring is 61 m tall and the St Philip's Cathedral is somewhat lower. 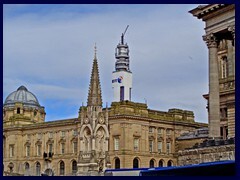 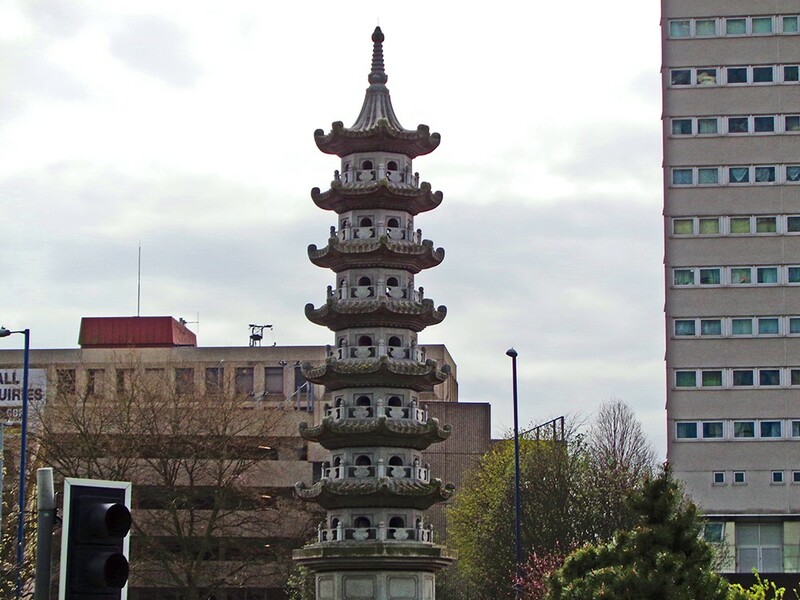 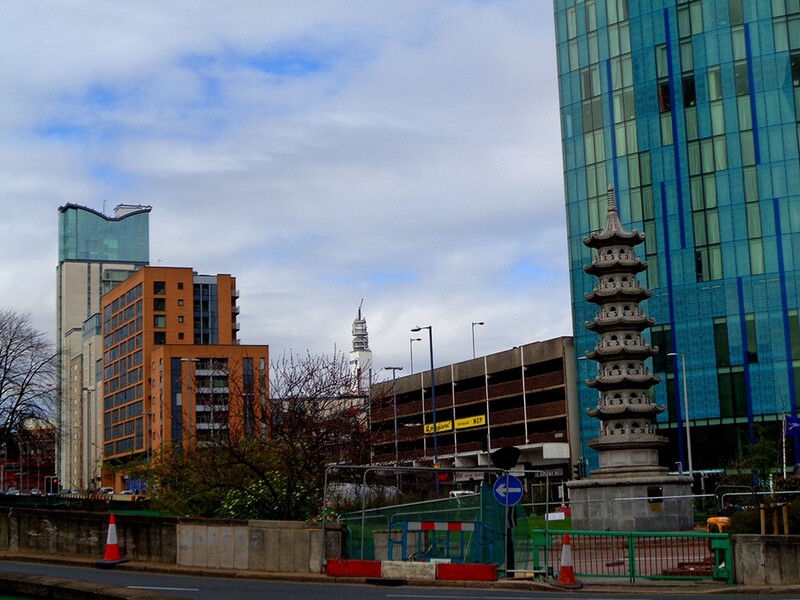 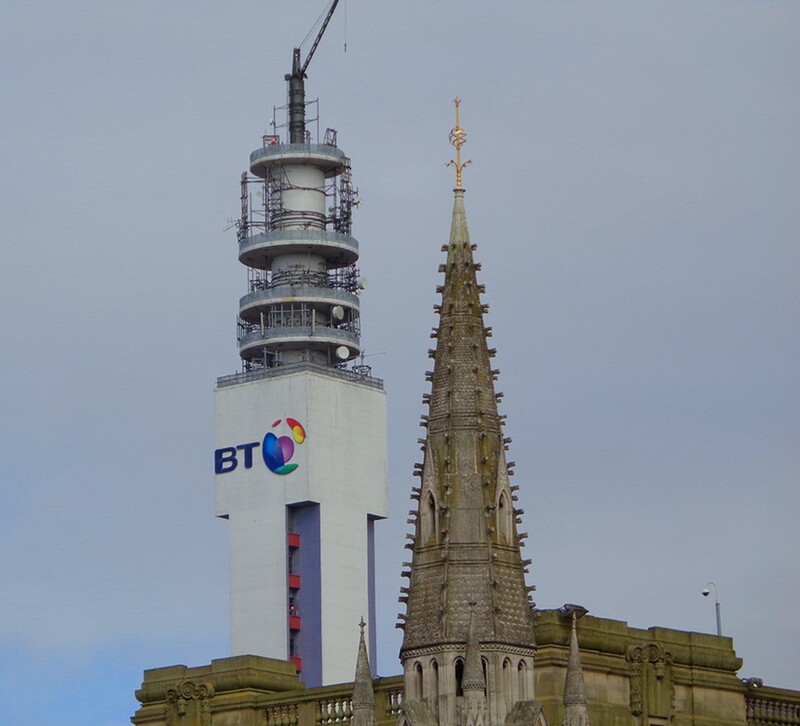 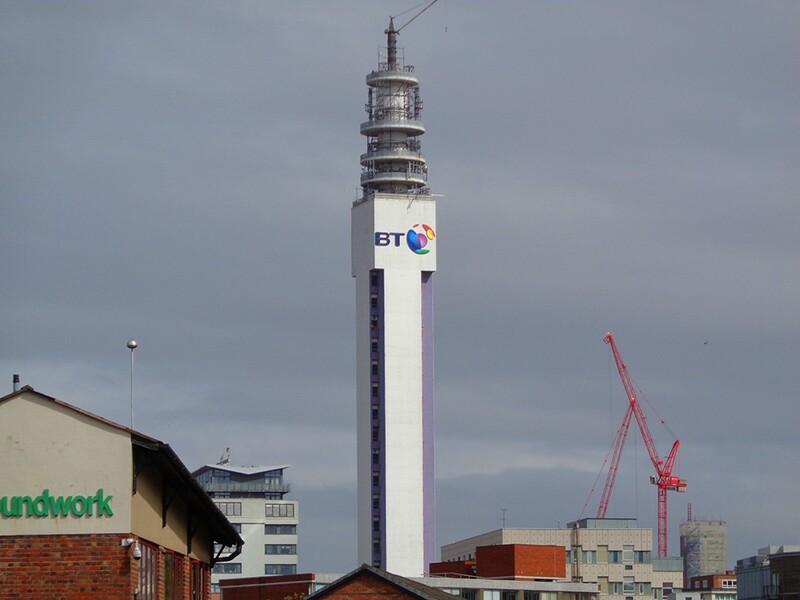 Despite the large number of tall towers, Birmingham does not feature any high observation decks, not even in the BT Tower. 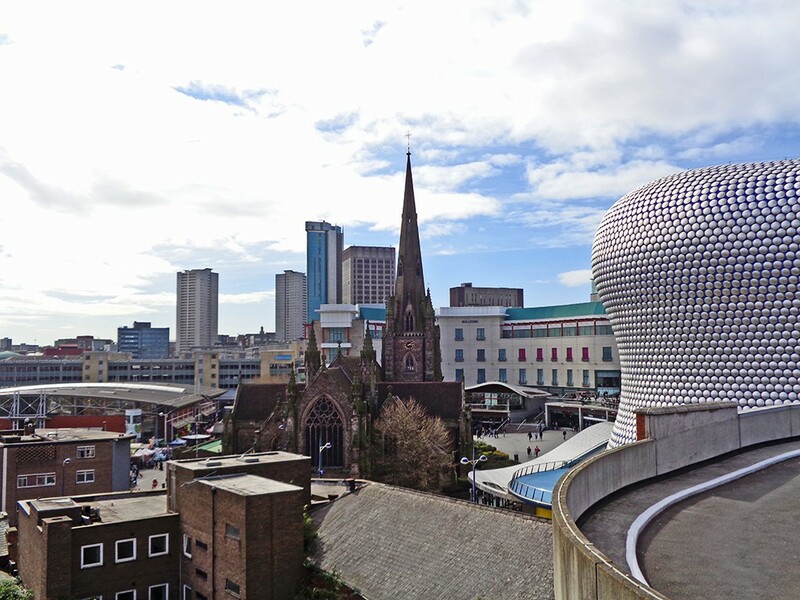 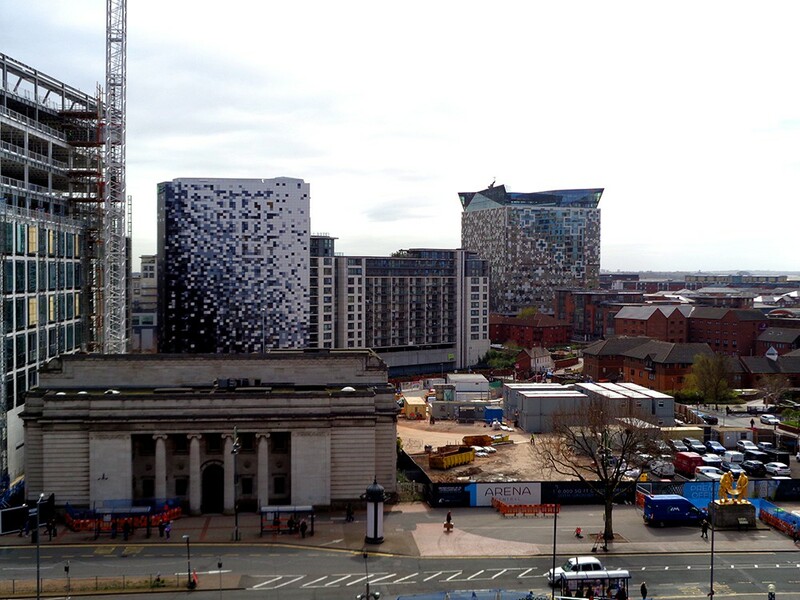 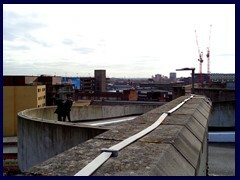 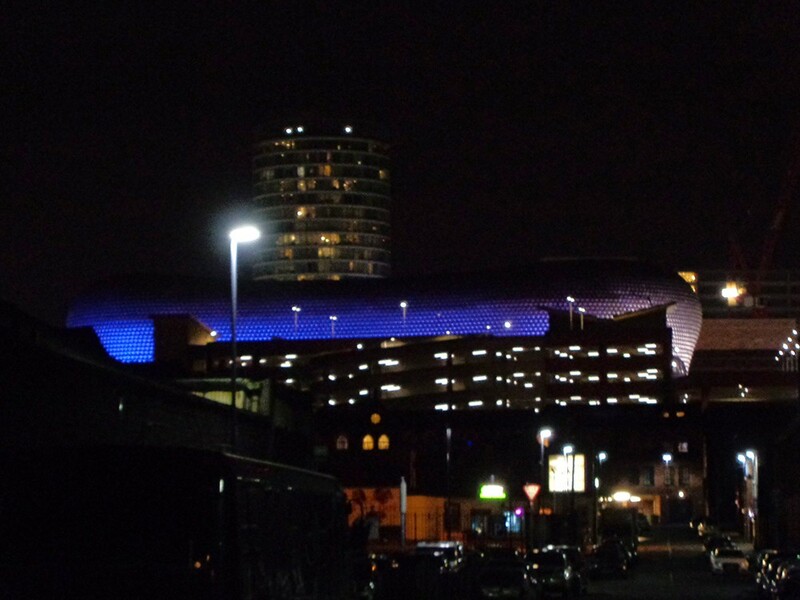 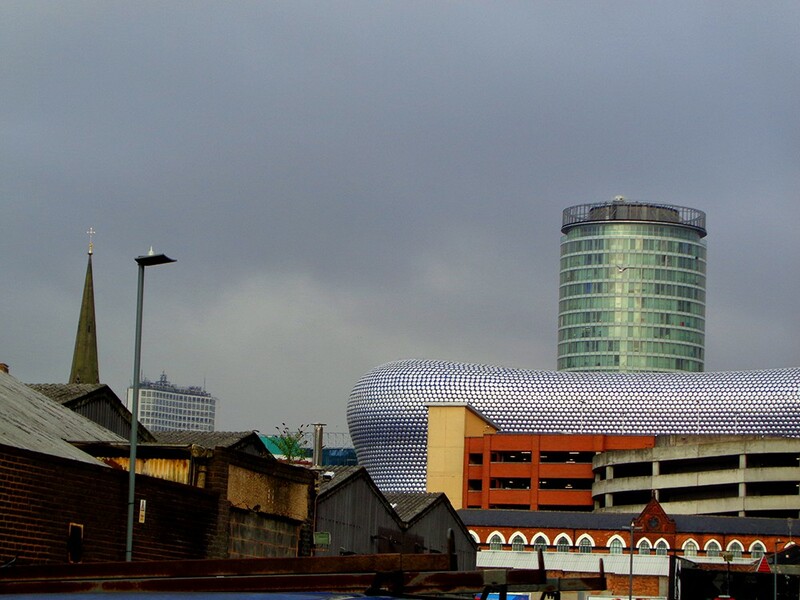 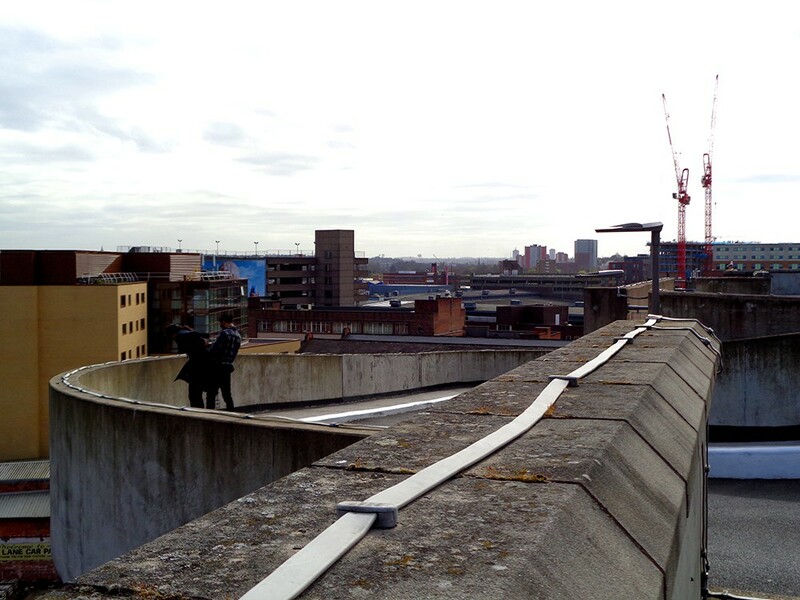 The rooftop deck of the 10-storey postmodern, high tech Library of Birmingham at Centenary Square (built in 2013), and the parking garage at the futuristic Selfridges store in the Bull Ring, were the best spots we could find to watch the skyline from above. 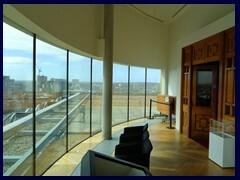 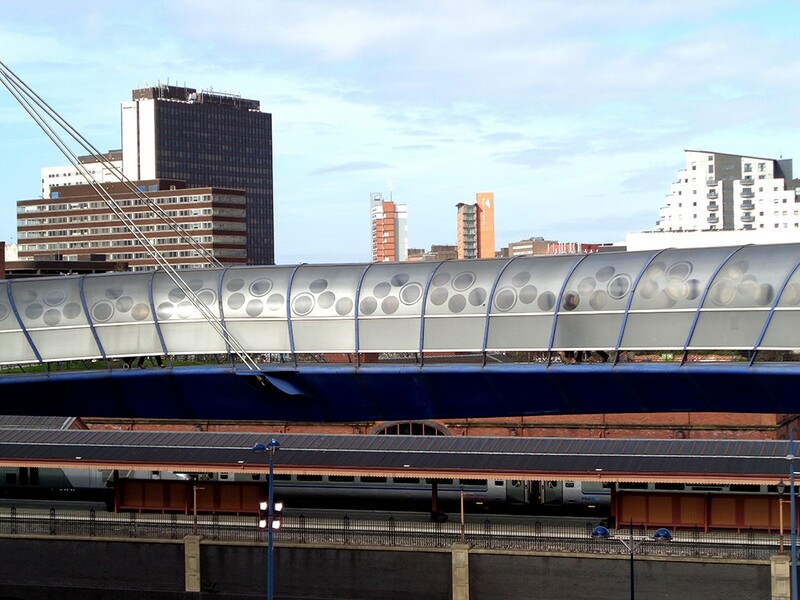 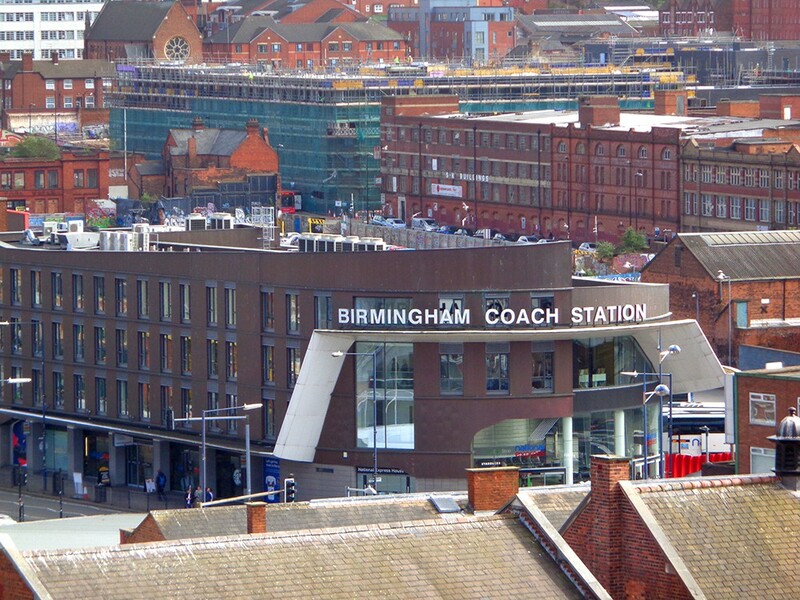 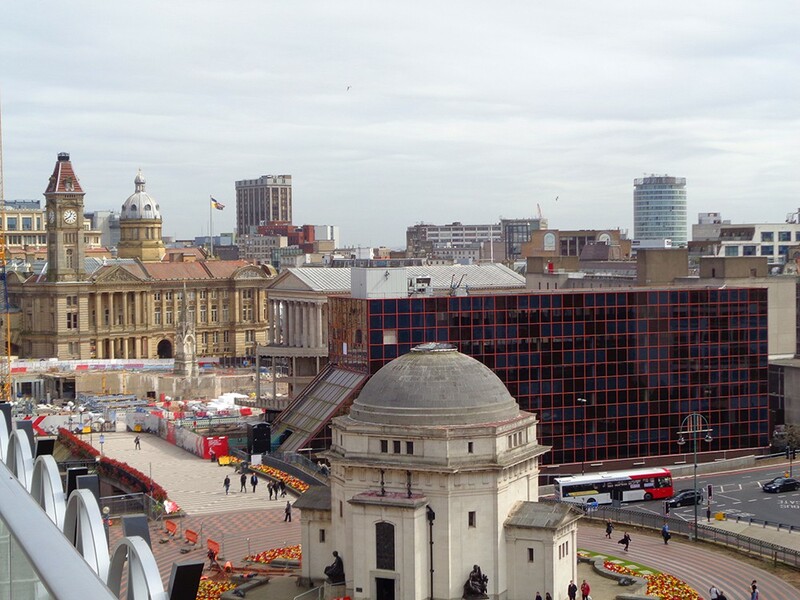 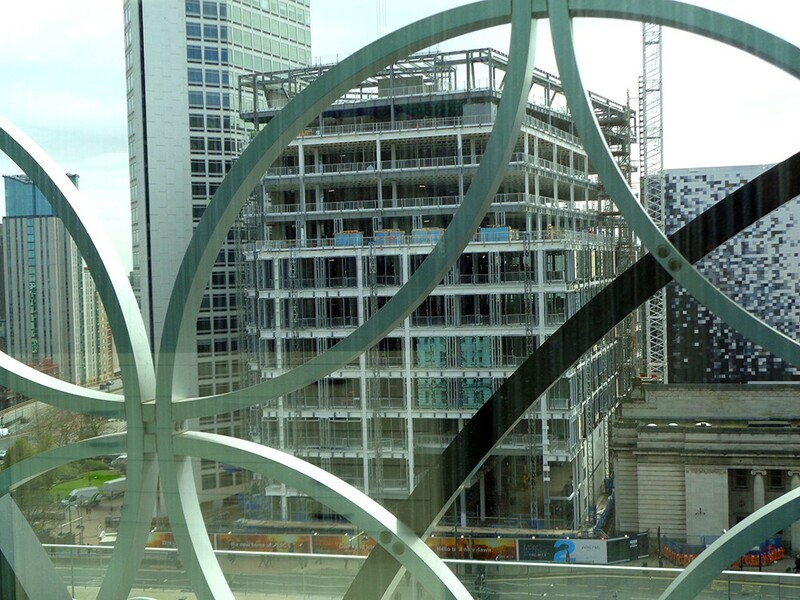 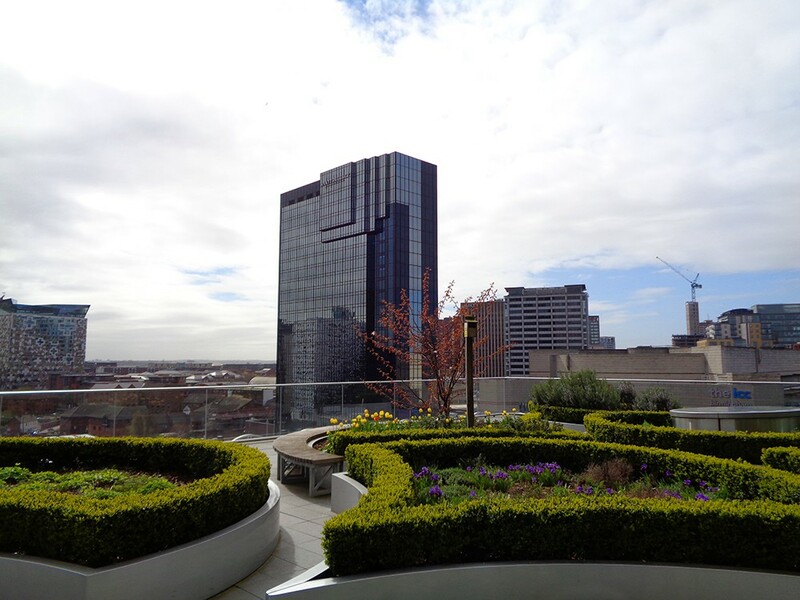 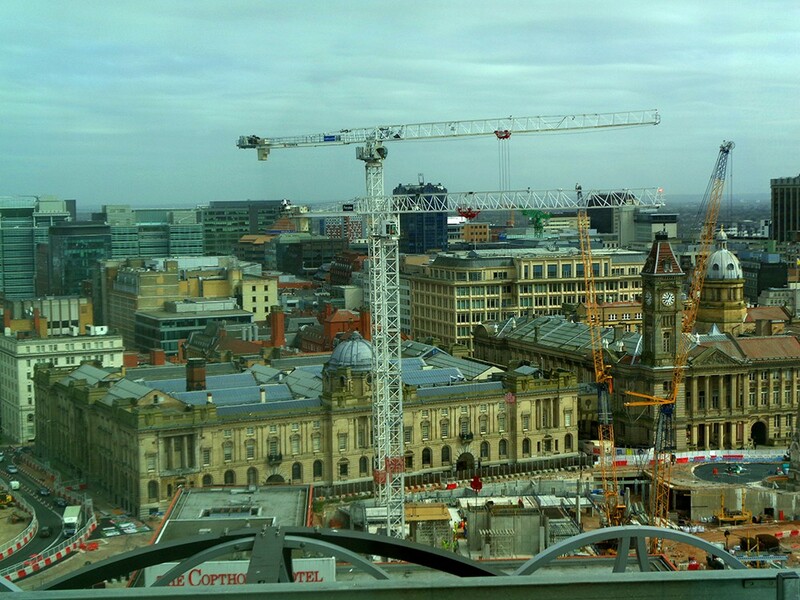 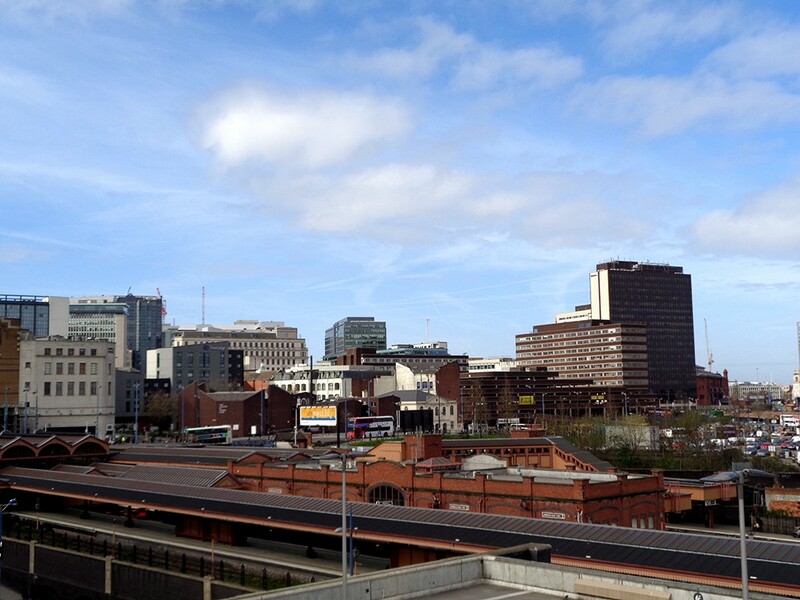 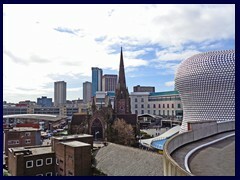 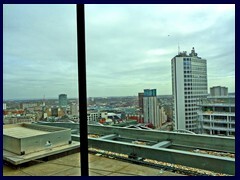 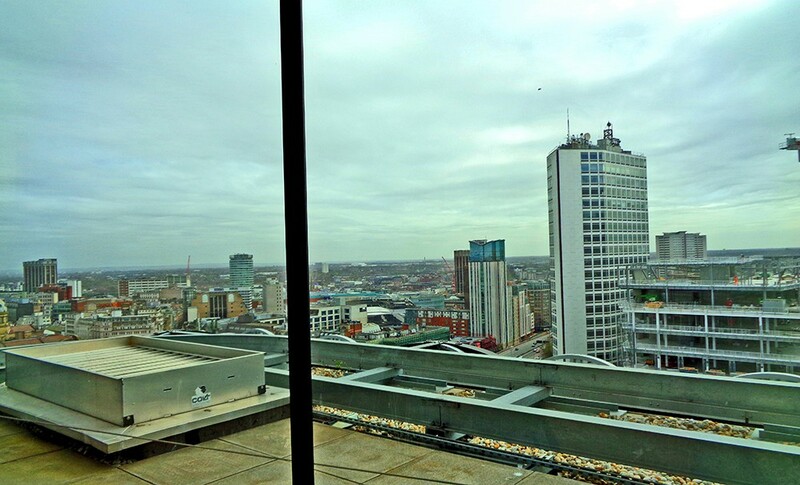 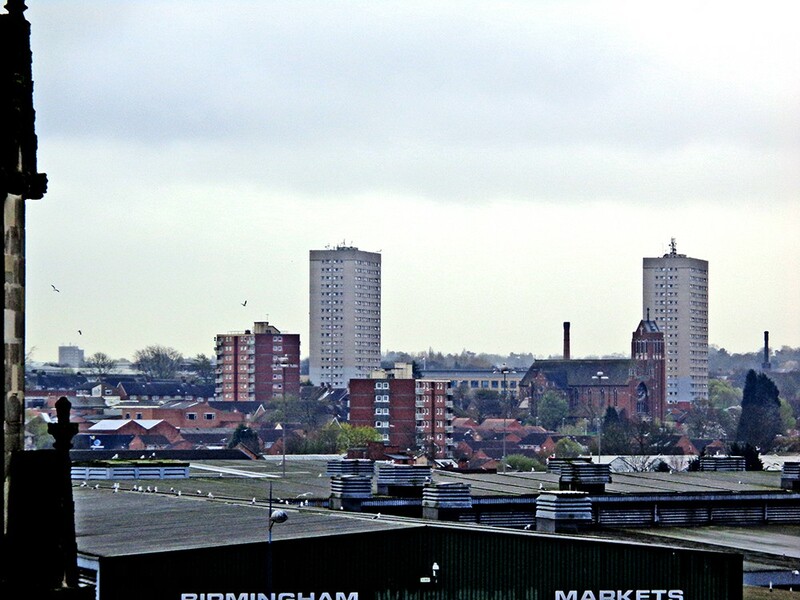 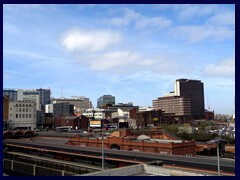 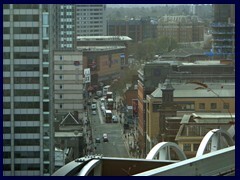 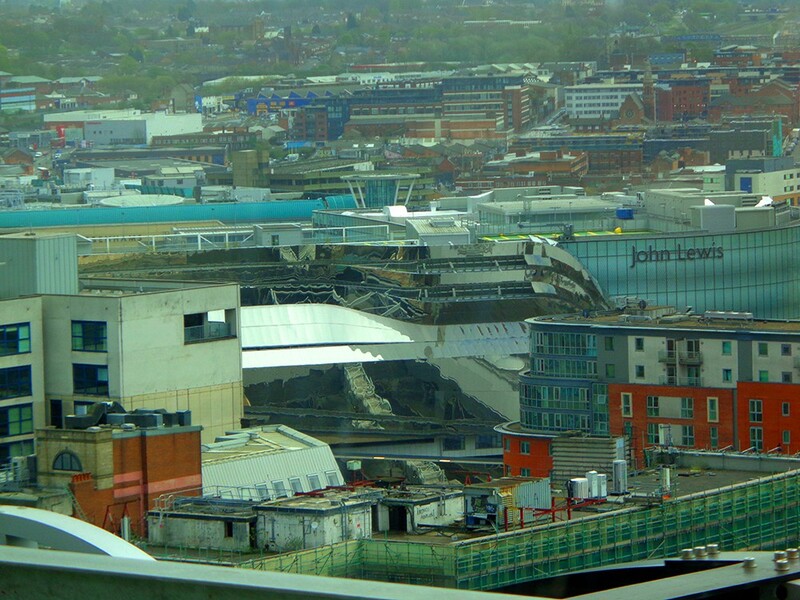 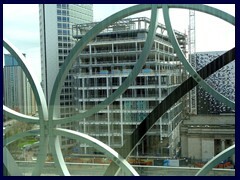 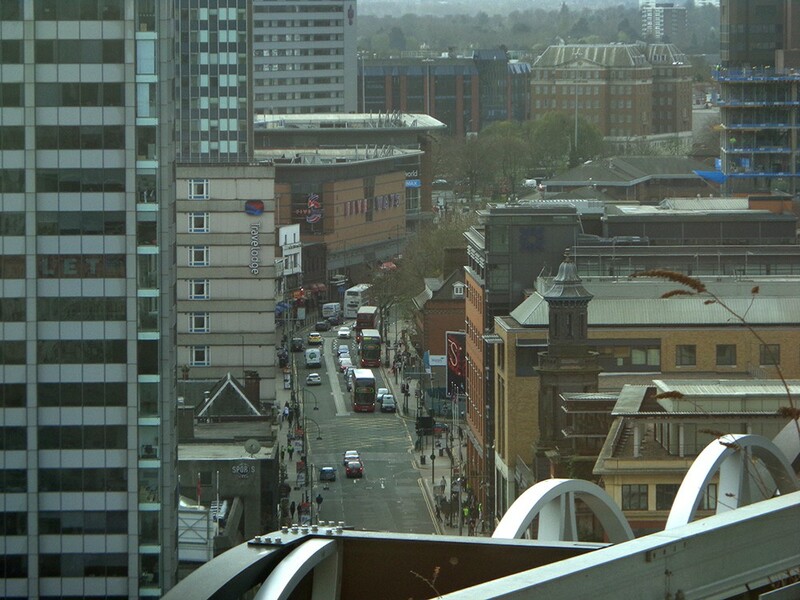 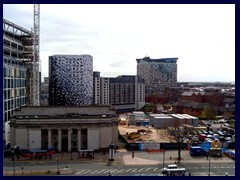 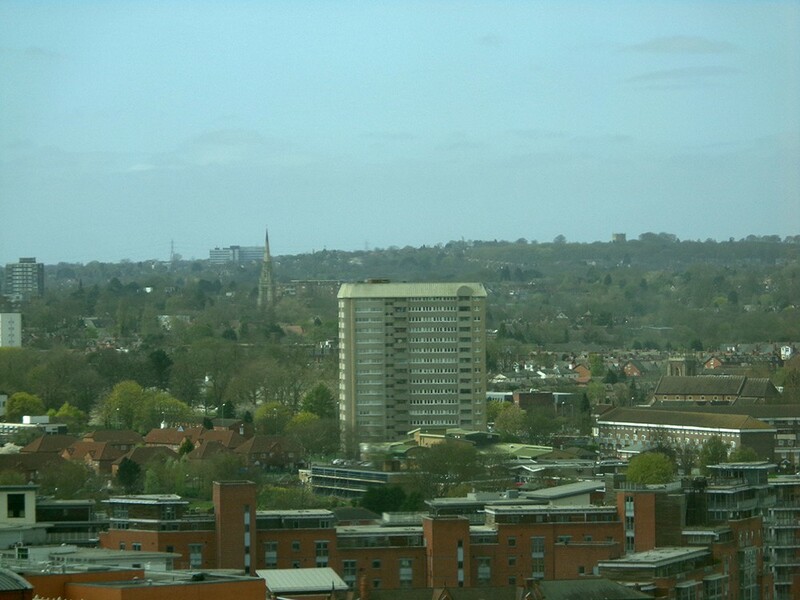 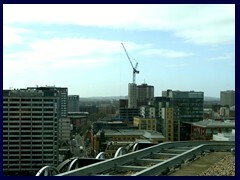 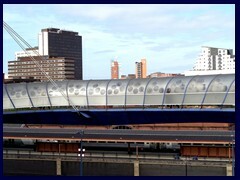 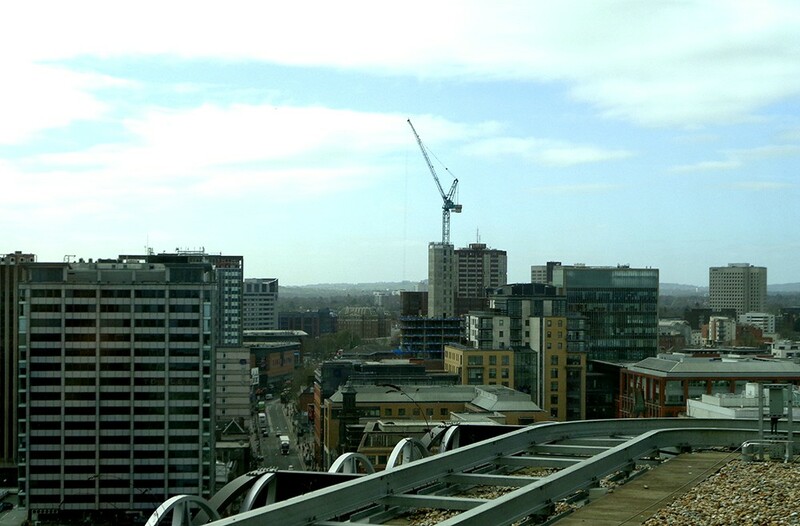 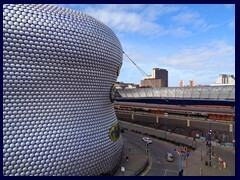 Guests at the Hyatt Regency, The Rotunda and other tall hotels can also enjoy great views of Birmingham.